This post is also available in Romanian. 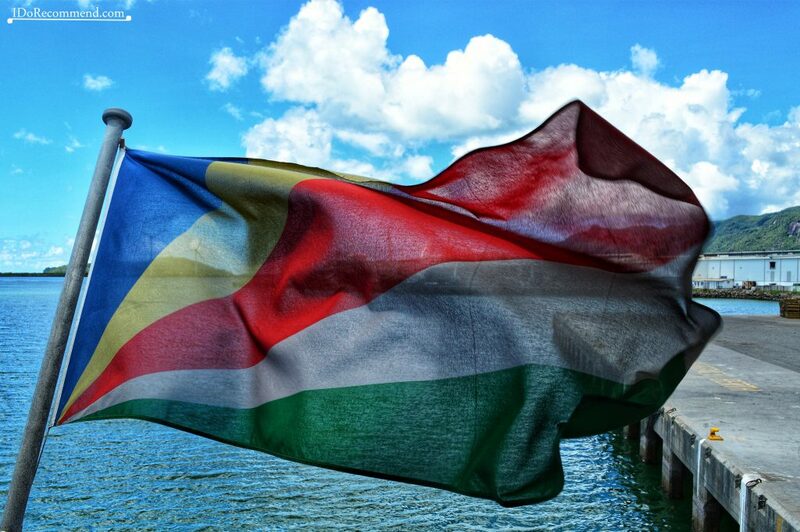 We chose to visit The Seychelles after seeing some unreal pictures of it on the Internet. We loved it so much that we decided to visit it twice, two years apart. 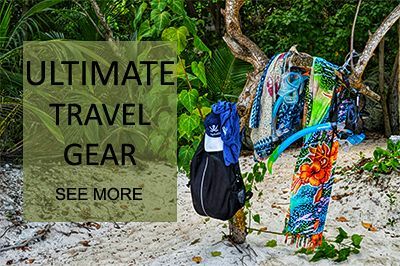 The photos displayed in this article will explain for sure our craziness of spending money twice on this destination. 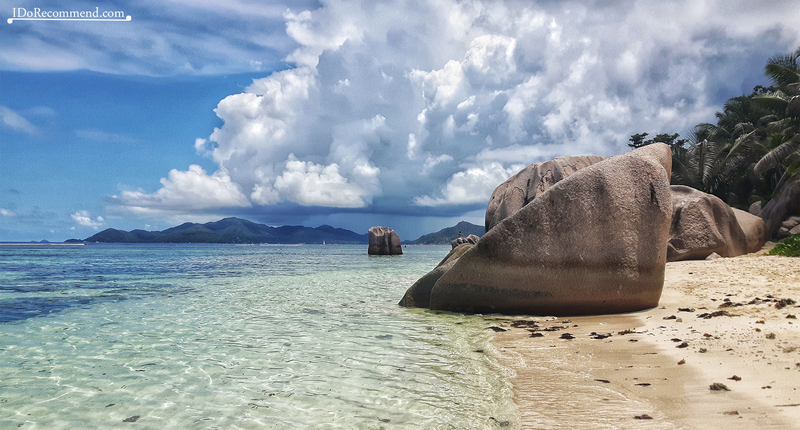 Each time we decided to visit the three most inhabited and popular islands: Mahé (with the capital Victoria), Praslin and La Digue (4th largest island). 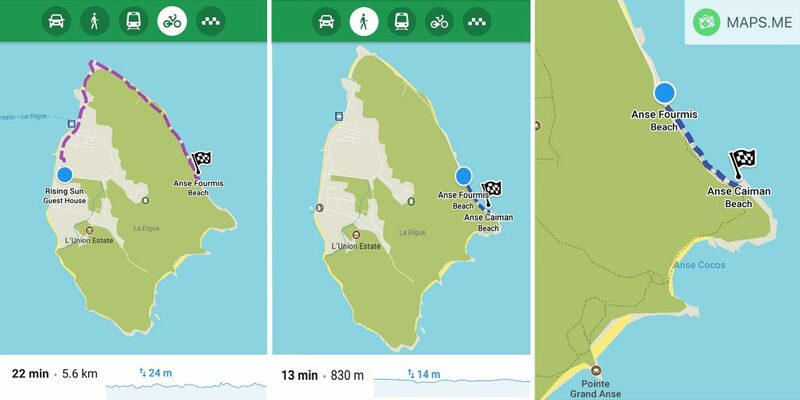 Click on the small arrow from the map (top left corner) to expand the map legend and visualize all the touristic objectives mentioned in this article. 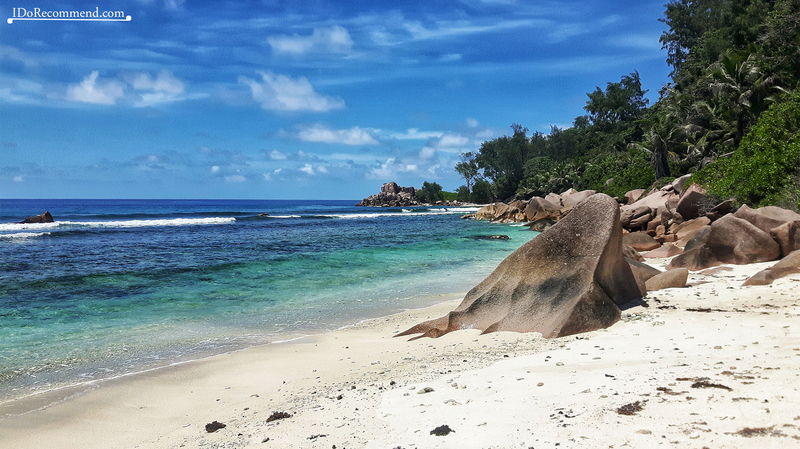 The amazing La Digue is by far our favorite island from all the exotic places which we have visited so far. 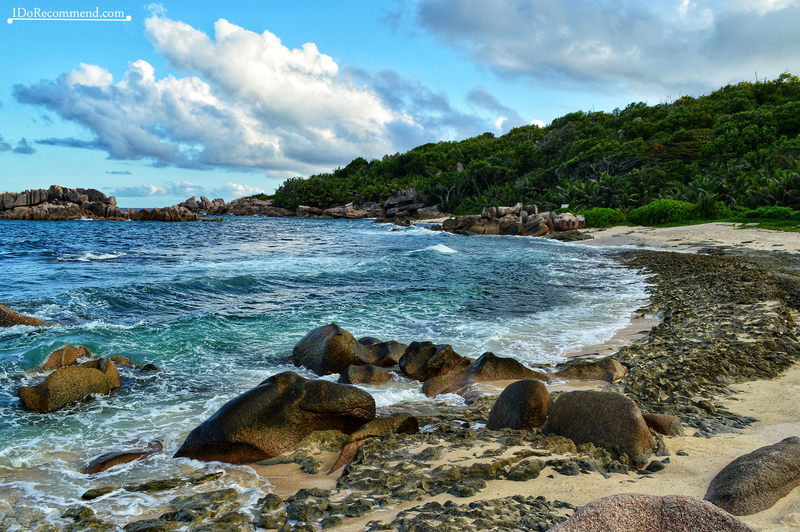 This article is related only to La Digue. 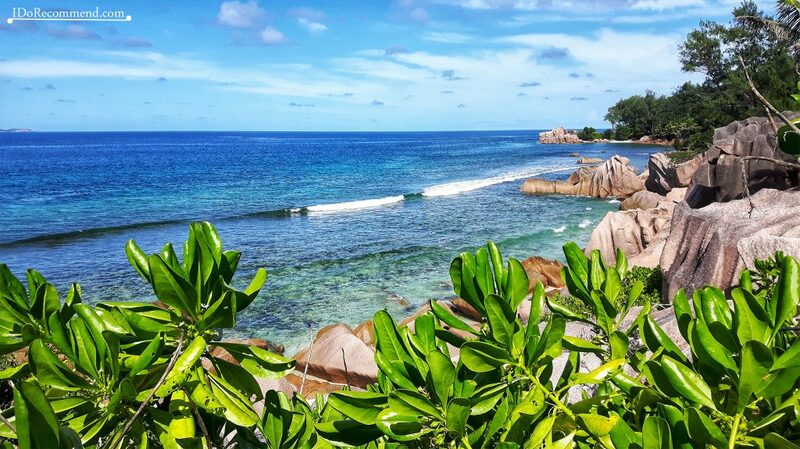 For Praslin there is a special article, Top 10 things to do in Praslin. 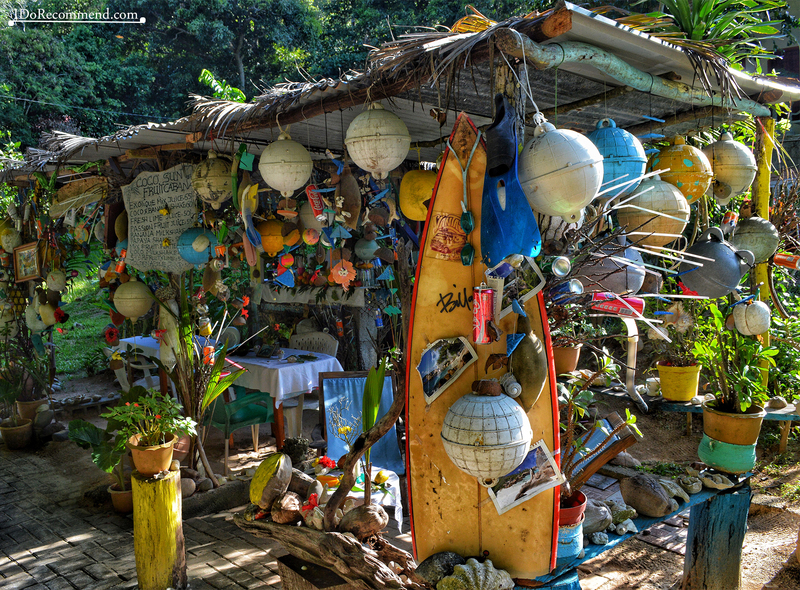 In Mahé we didn’t spend enough time, so we couldn’t visit many places. 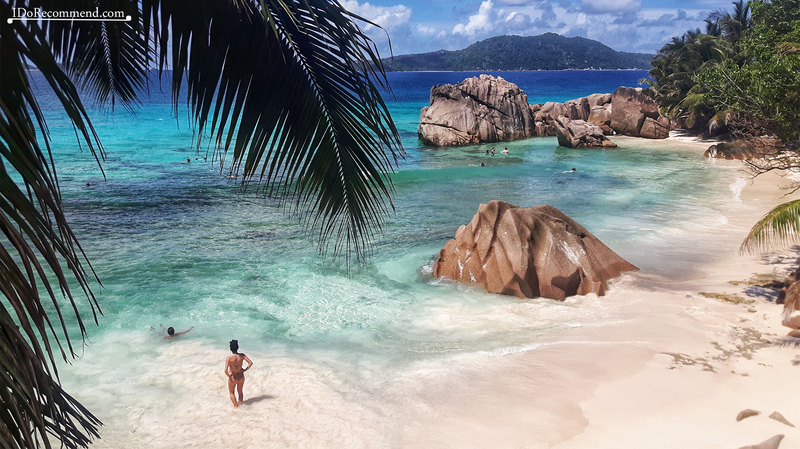 La Digue Island is the fourth largest island in Seychelles and lies 40 kilometers (25 miles) from Mahé and 7 km (3.5 miles) from Praslin. 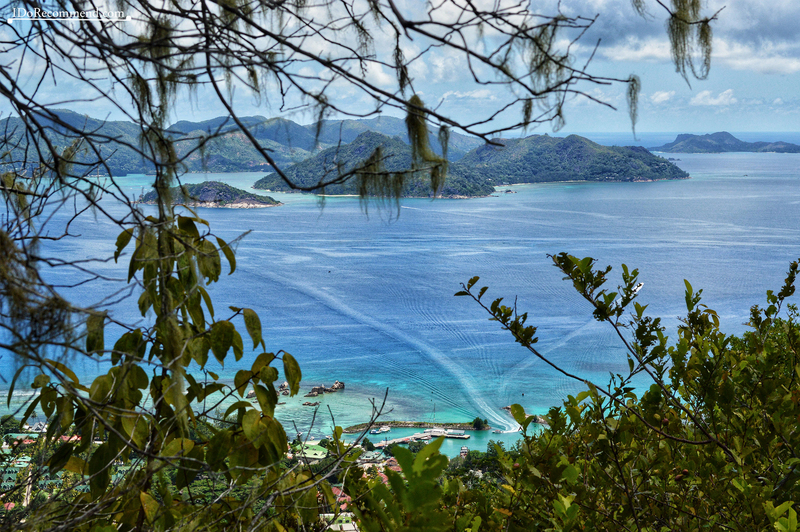 The island has a population of around 2,900 people. 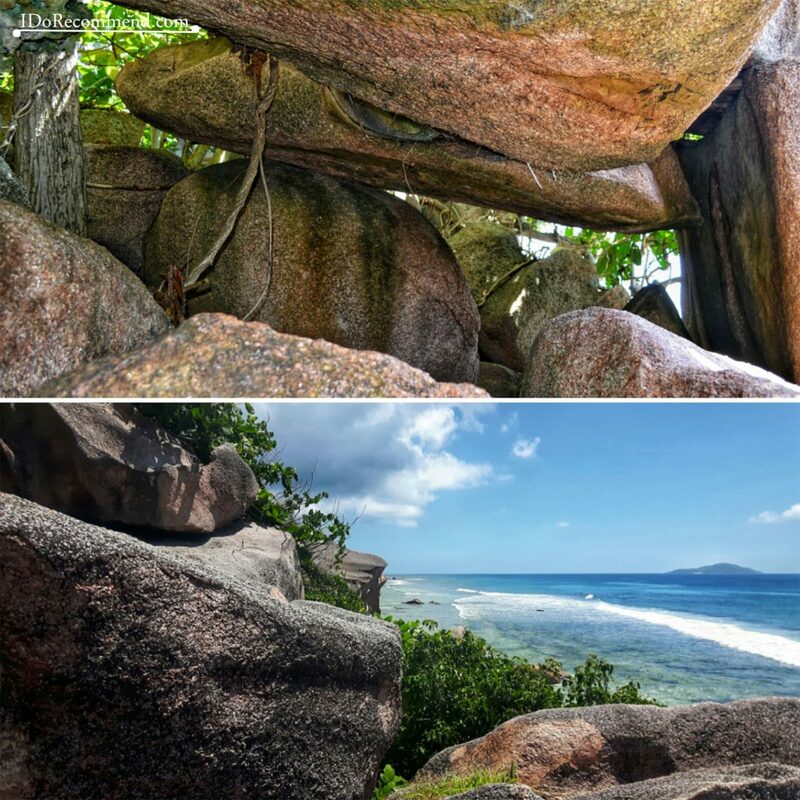 The highest elevation on the island, Nid d’Aigle (333m), that is at 10 min climbing from Belle Vue point, offers an almost-perfect 360 degree view of La Digue and its neighboring islands. 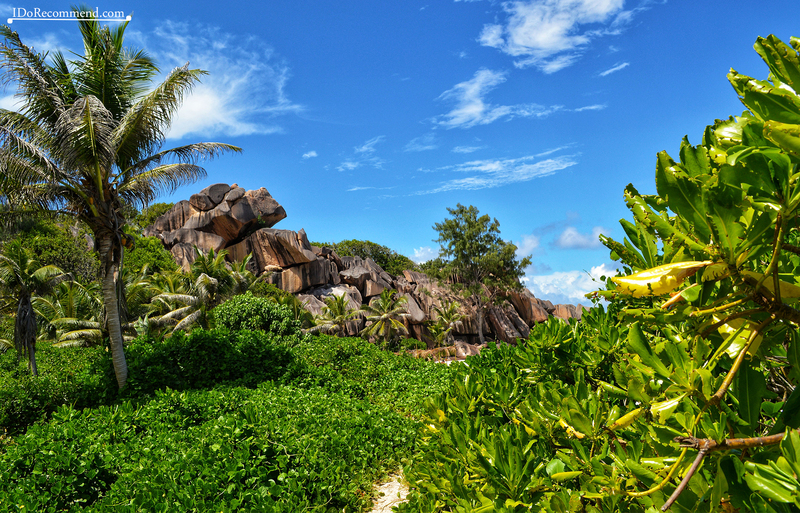 La Digue has already started to draft a five-year plan in order to achieve 100% green status by the year 2020. 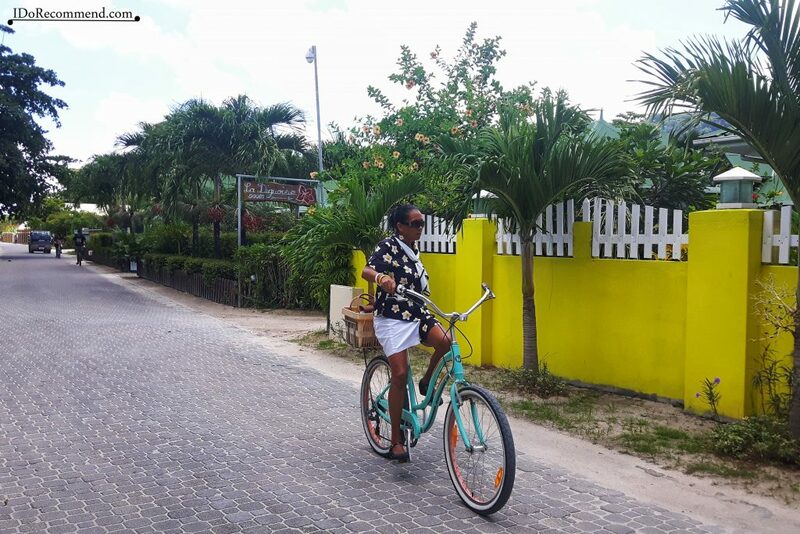 Since then various initiatives have been undertaken to transform the island into the country’s eco-capital, including the introduction of clean energy vehicles. 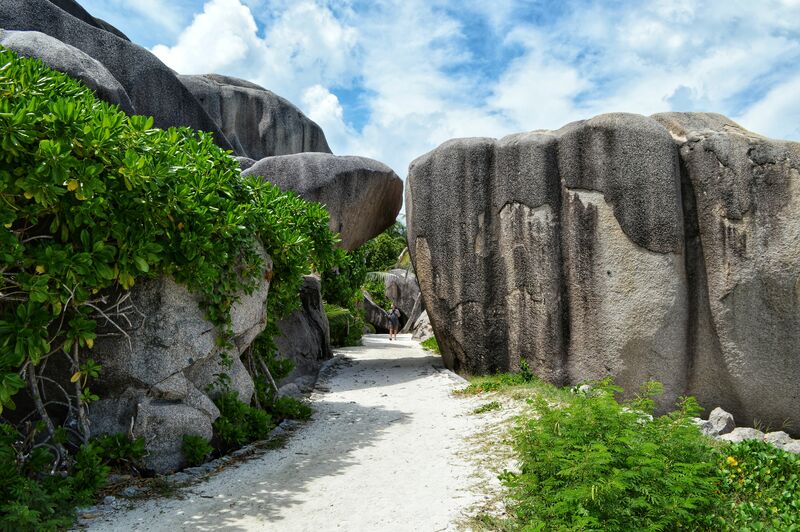 La Digue has narrow roads and is not as crowded as the other bigger islands. 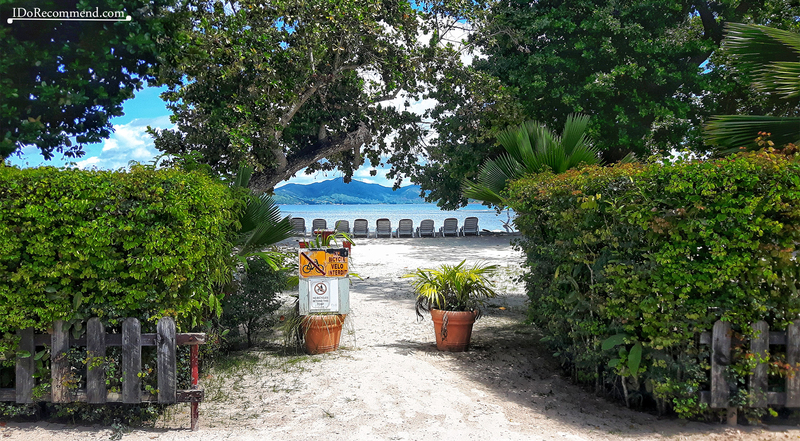 It can be easily explored on foot or by bicycles which are parked all over the places: in front of the guesthouses, on the beaches. 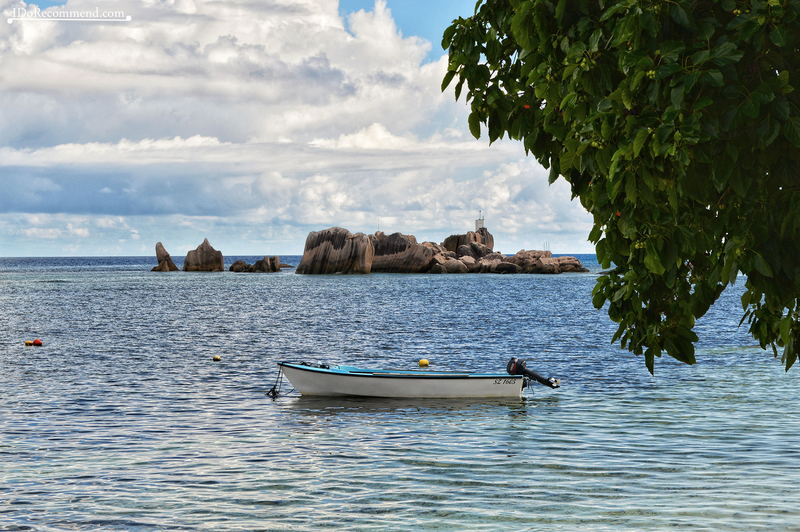 There are no buses on La Digue island. 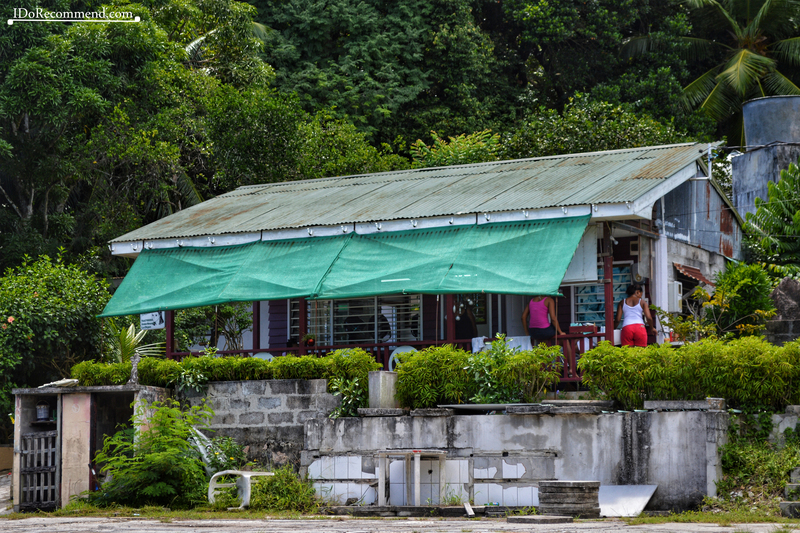 When arriving to the island by ferry at La Digue Marina there are lots of Creole people offering their service to get you to your hotel/resort by car/by bicycle. Grocery stores and fresh markets are extremely limited. As there are no street lamps on the island and the bicycles often don’t have their own light, a flashlight or better a headlamp would be very useful during the night. 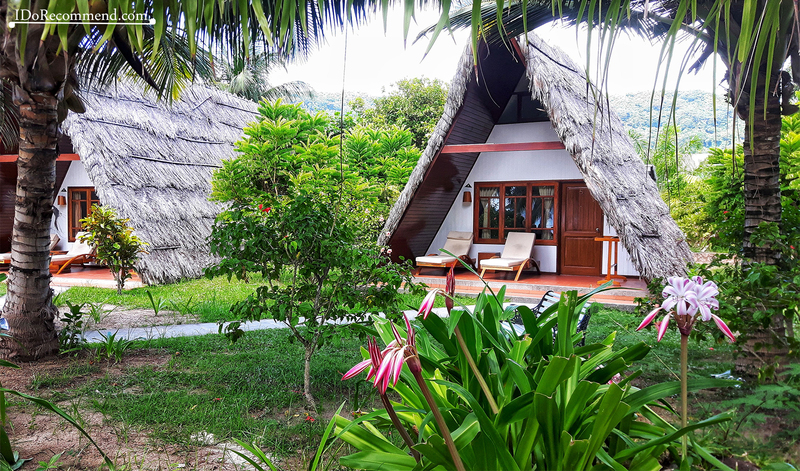 Check out this useful website, SeyVillas, offering lots of accommodation choises and giving specific information about the beaches. 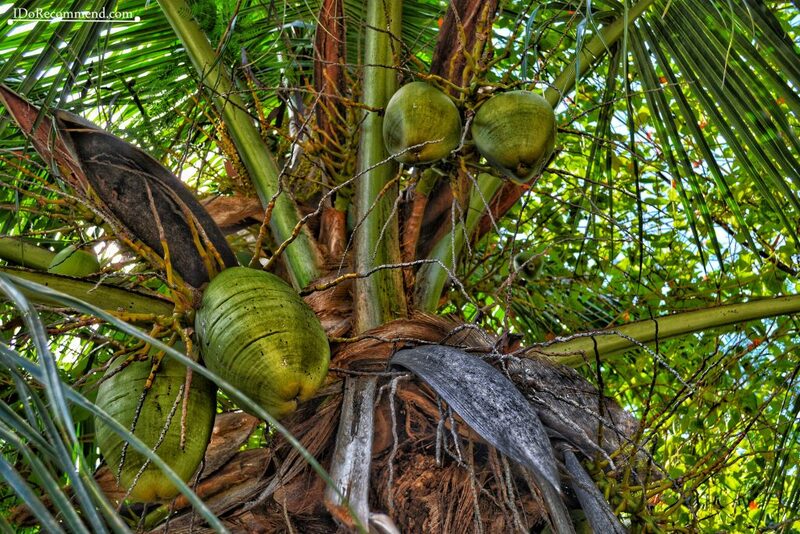 Coconuts falling from trees may cause serious injury. Take care when swimming or snorkeling. 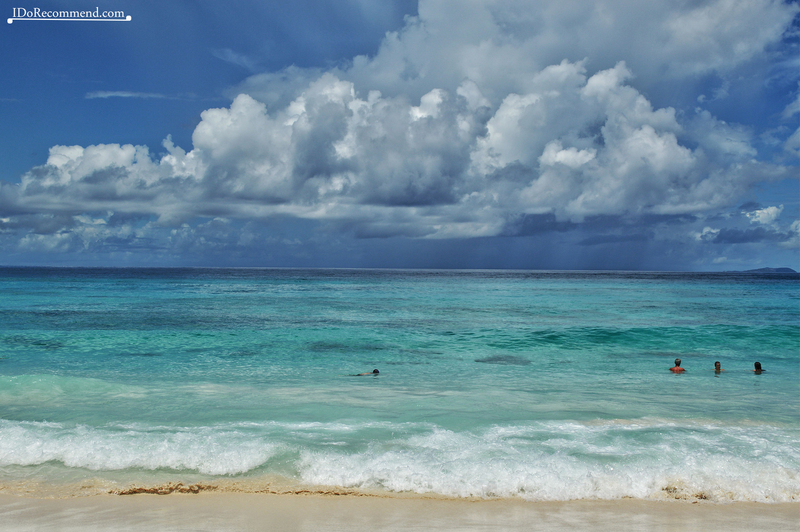 There are strong currents on different beaches at different times. 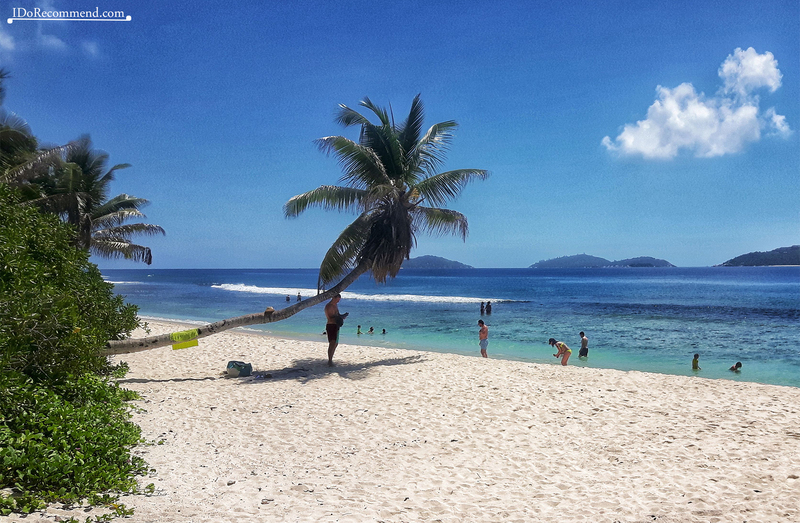 Beaches that offer safe swimming during the south east monsoon (May to September) may not be safe during the north east monsoon (November to March) and vice versa. Seek local advice, heed signage on beaches and stay within your depth. 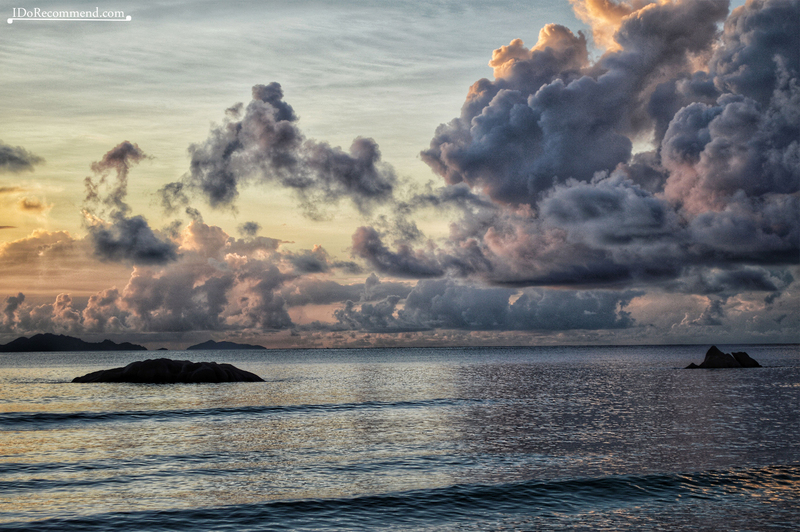 Beaches do not always show safety information and you shouldn’t assume they’re safe. 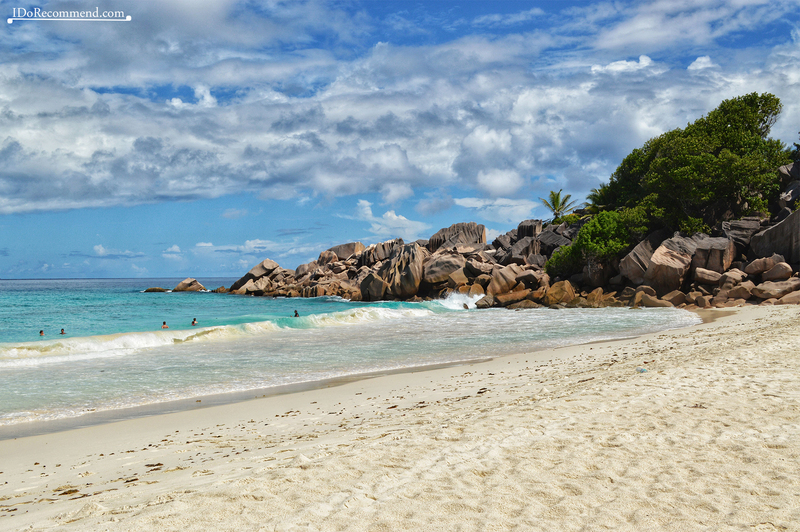 Life Guards does not exist on most of the beaches from La Digue. 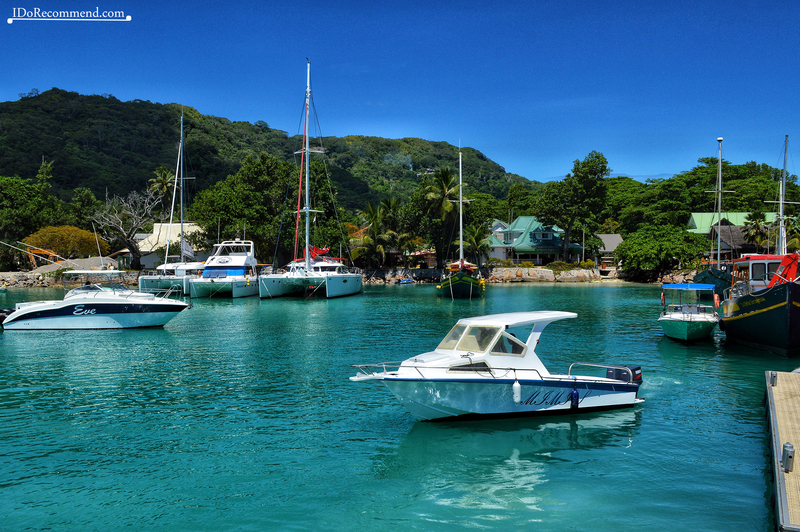 Most of the inner island resorts are accessible by ferry. 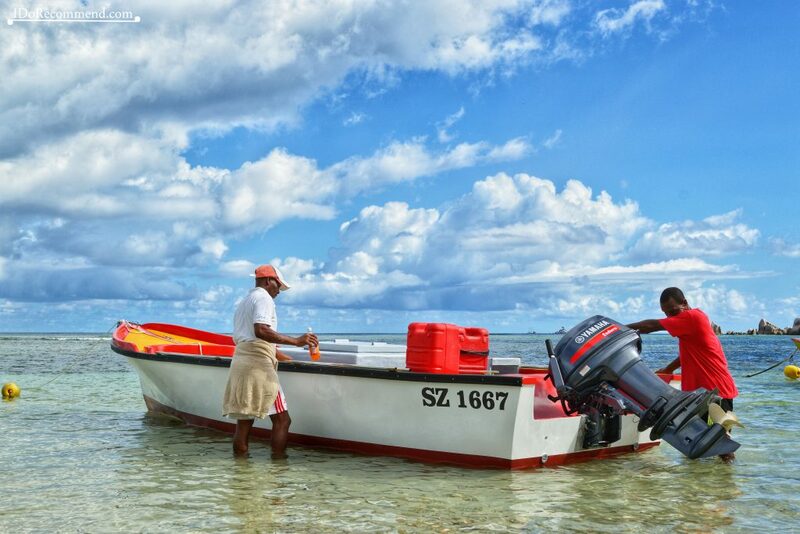 You should pay attention to safety briefings and make sure life jackets are provided, especially on smaller excursion boats. 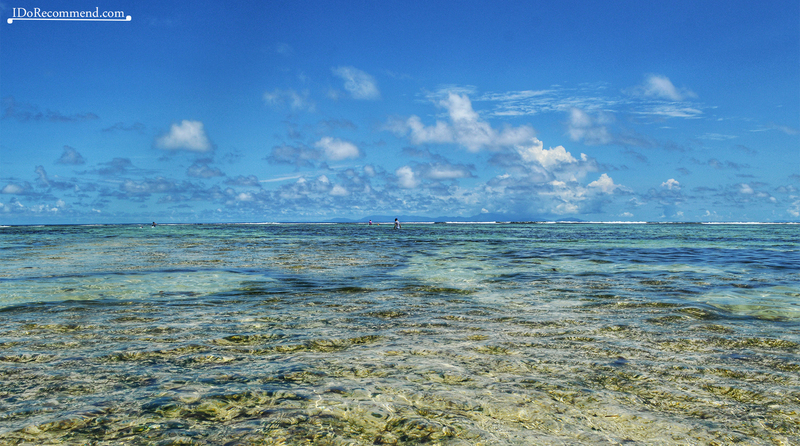 Be careful of injuring your feet or other exposed areas on coral rocks. 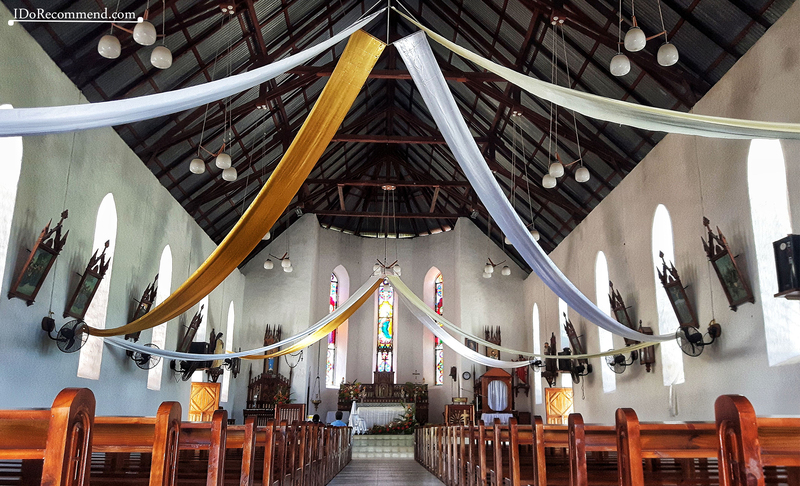 There are certain dishes that were once part of Seychellois custom that are now illegal. 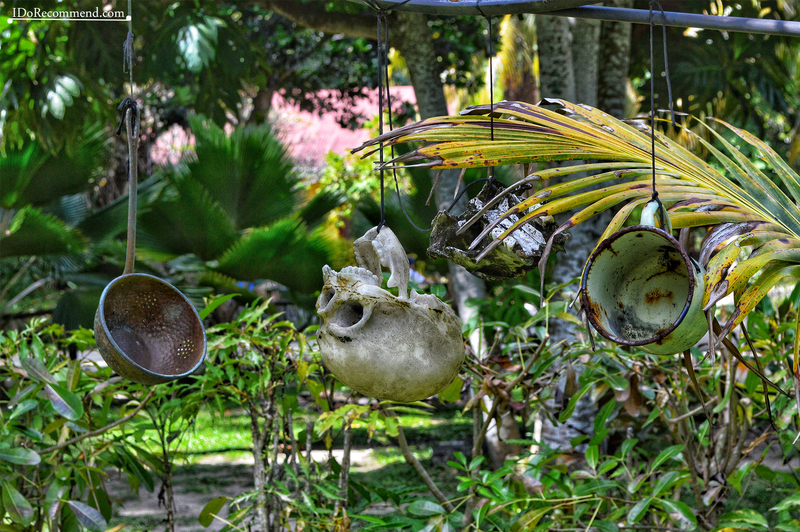 Unfortunately, some of these old traditional foods are still illegally eaten. If you’re offered dolphin, turtle, tortoise, or coco de mer it is illegal – do not eat it! You can eat instead a lot of fresh fish. 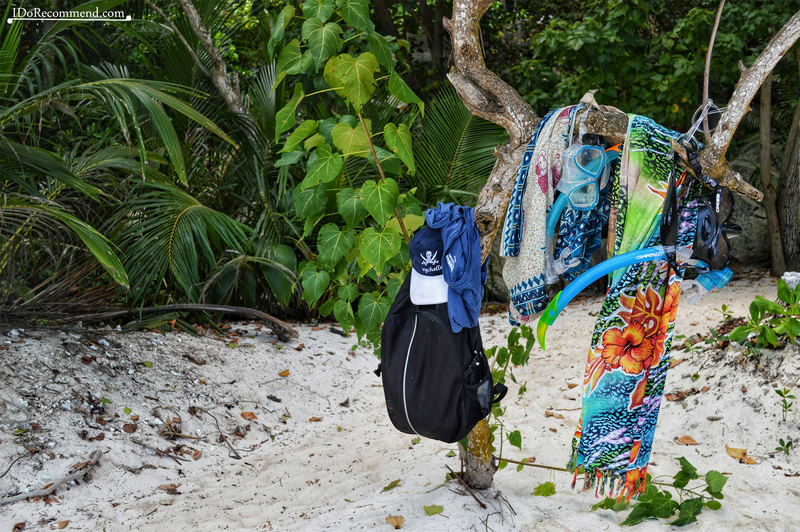 In order to avoid being bitten by them, make sure you bring a thick beach mat or beach towel to sit on. If you use insect repellent, that can also help. If you do happen to be bitten, tea tree oil and zinc salves are good treatments against the bites themselves. 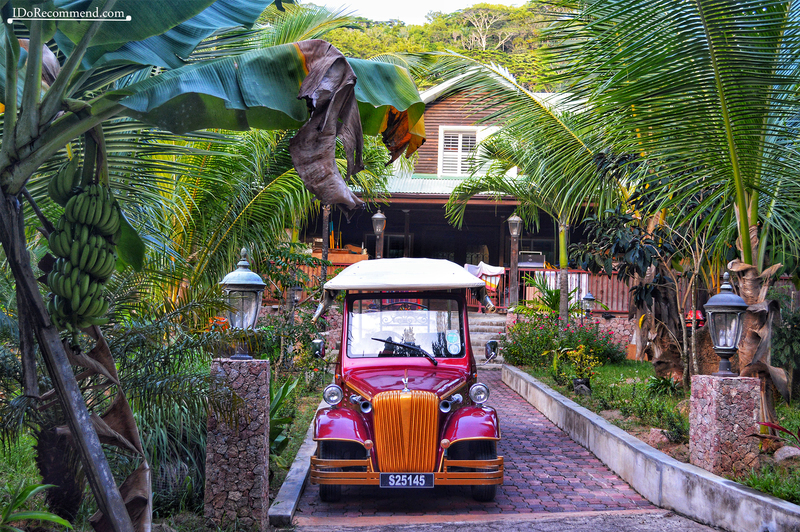 Credit cards are rarely accepted outside of major hotels. 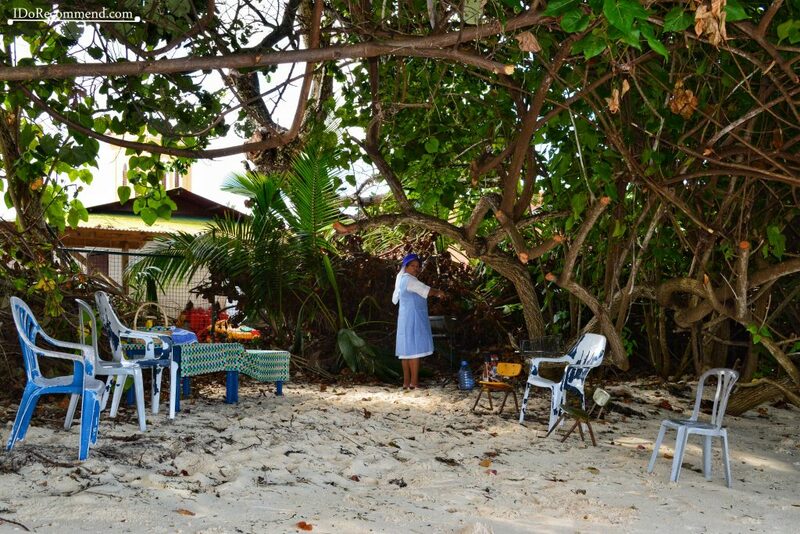 There are only 4 ATM on La Digue island. 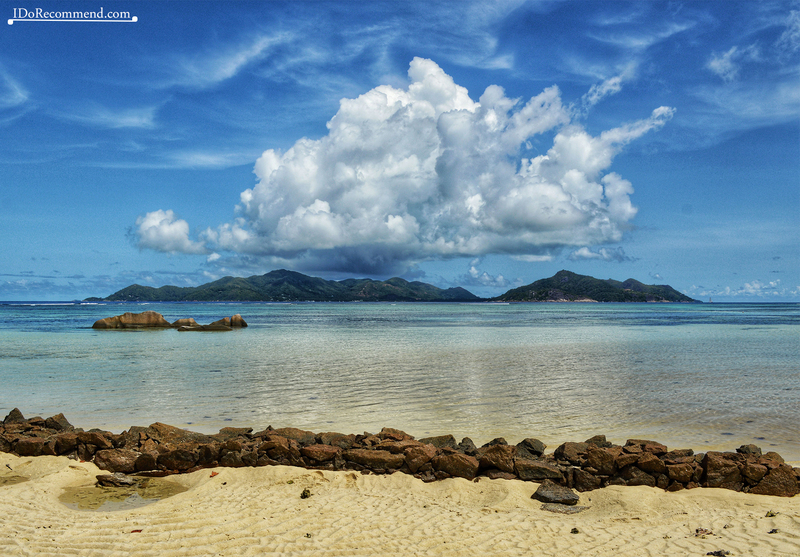 La Digue Island in The Seychelles. 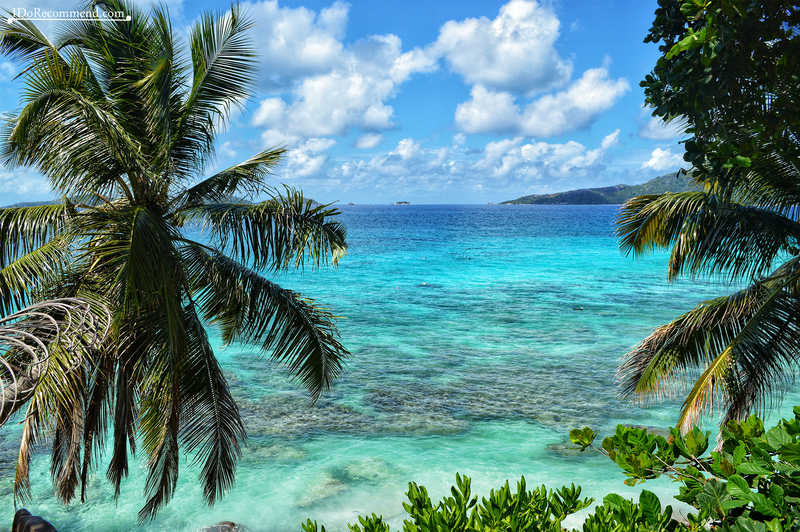 Airline tickets to The Seychelles → momondo.com – we chose a Qatar Airlines flight from Europe with one stop in Doha. 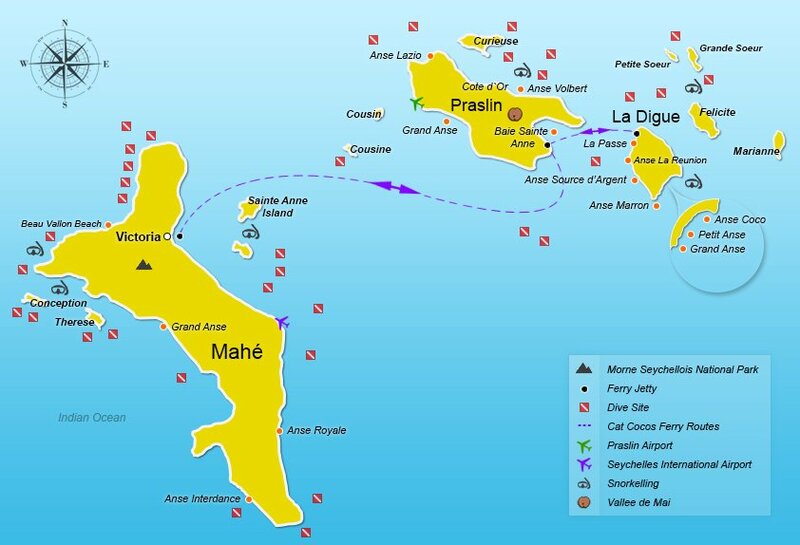 Arrive to La Digue (all the information here) → by high-speed catamaran from Victoria jetty, Mahé island (Cat Cocos ferry operator). 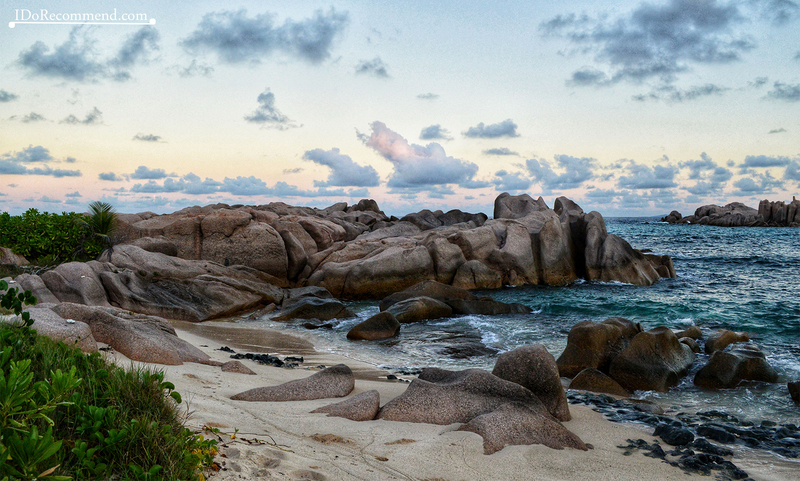 Inside La Digue → explored the island on foot or by bicycle (rent a bike). Guesthouse → booking.com (The Rising Sun Guesthouse). Airplane ticket → it depends on the period and on your departure city. 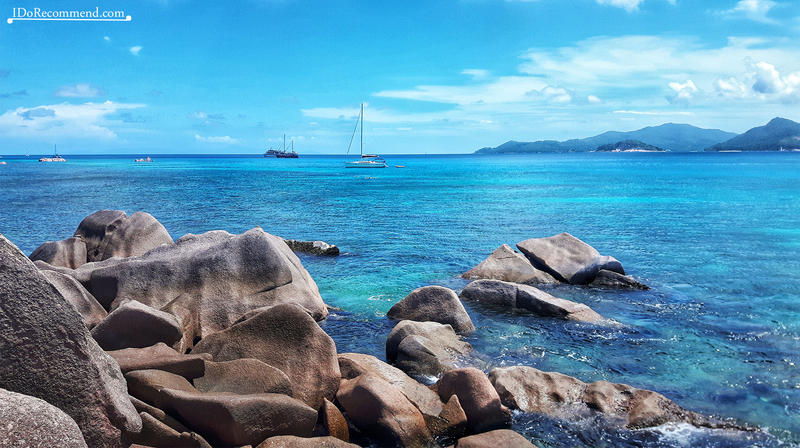 Fast ferry → 122 euro/person in the main cabin (round trip from Victoria jetty to La Digue Marina). 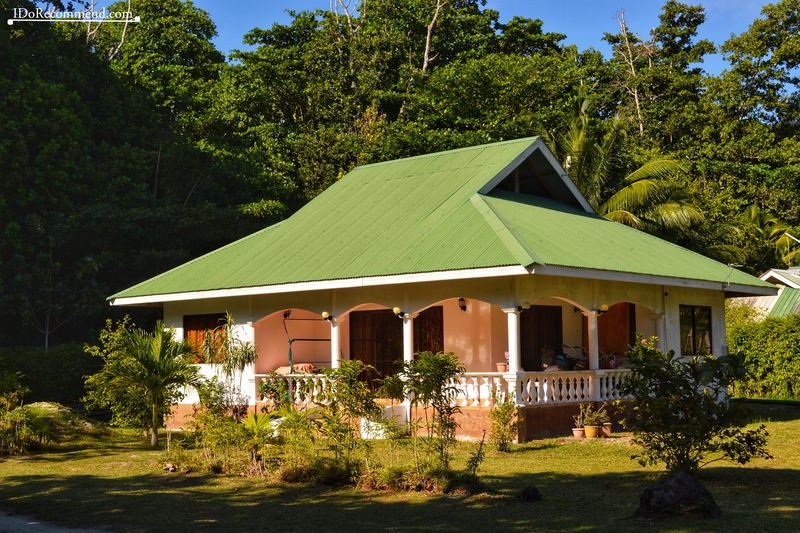 Guesthouse → 150 euro/double room/night (breakfast and dinner included). 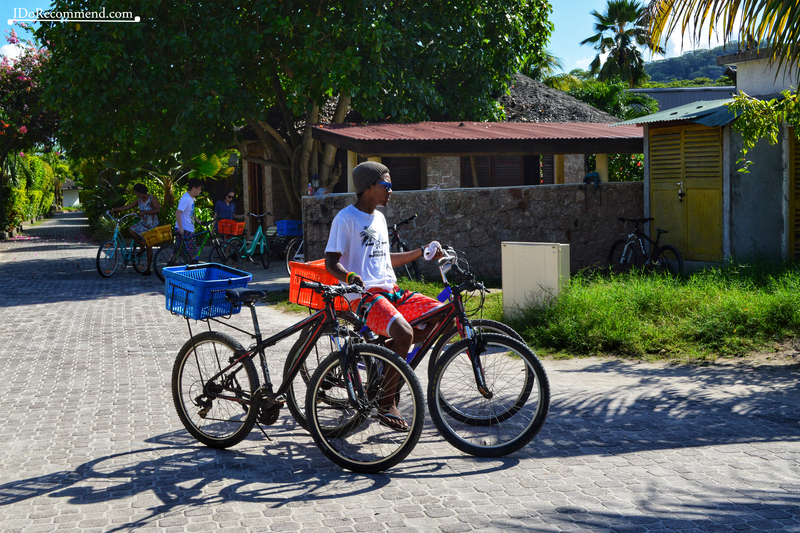 Bike rental → 100 SCR/bike/day (around 7-10 euro). 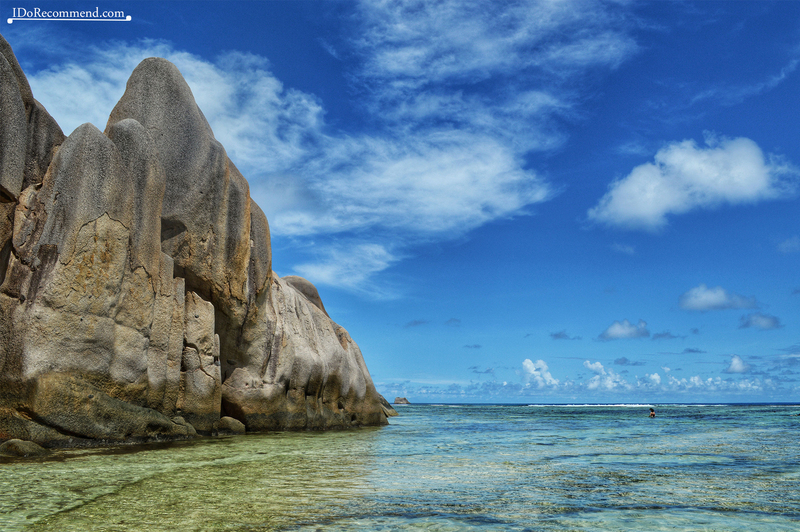 La Digue was the most beautiful exotic destination we’ve seen so far. 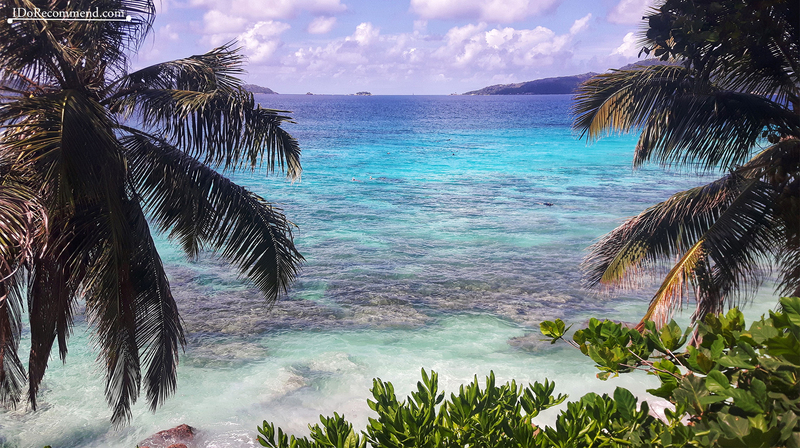 This place is a tropical paradise (stunning landscapes with white-sand beaches everywhere and gorgeous, lush jungle covering the islands’ hills). However, we were totally surprised to find that amazing island more noisy and polluted in 2017 compared to 2015 when there were no cars. 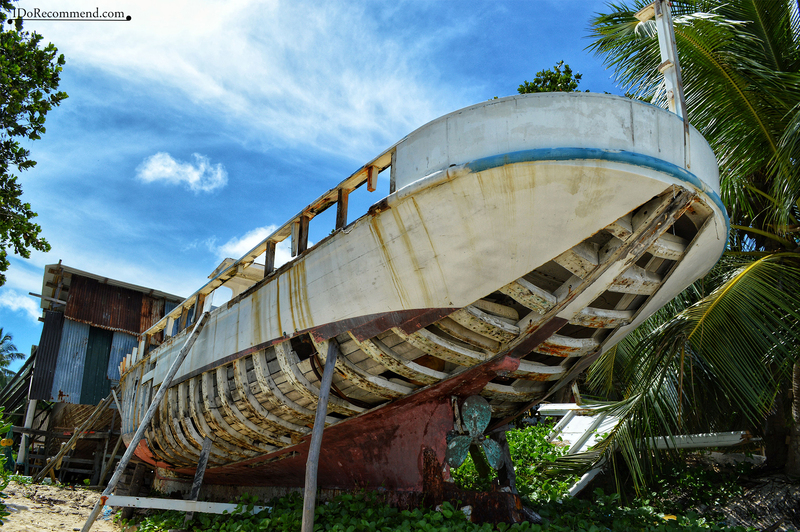 It’s a pitty, the island is losing its charm! Wi-Fi was available in the room free of charge. 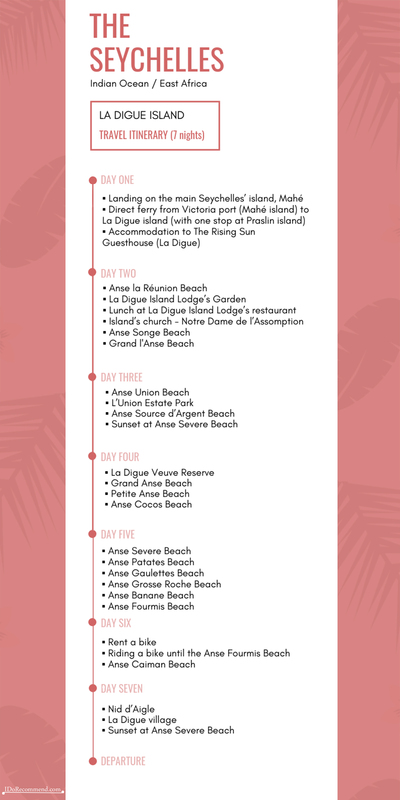 We wanted to make sure that we had enough time to explore every single beach (or as many as possible) in one week. 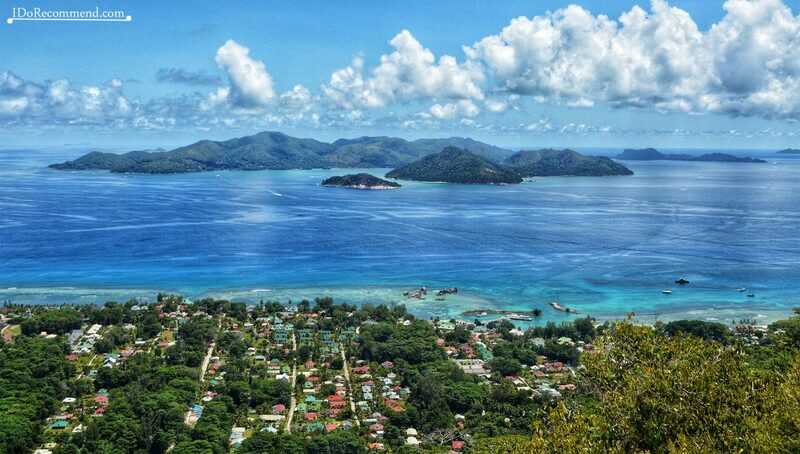 Seychelles’ International Airport is on the country’s biggest island, Mahé. On the same island is also located its capital, Victoria. As soon as you got off the plane, you will feel a hot breeze. 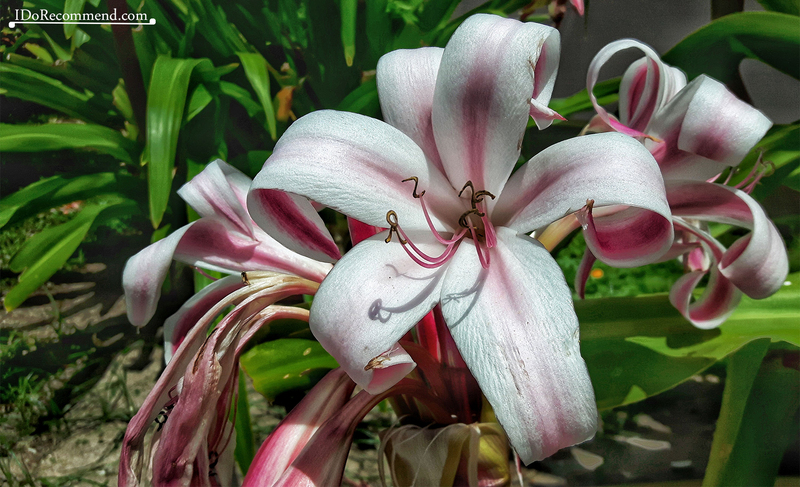 This is due to the tropical climate. 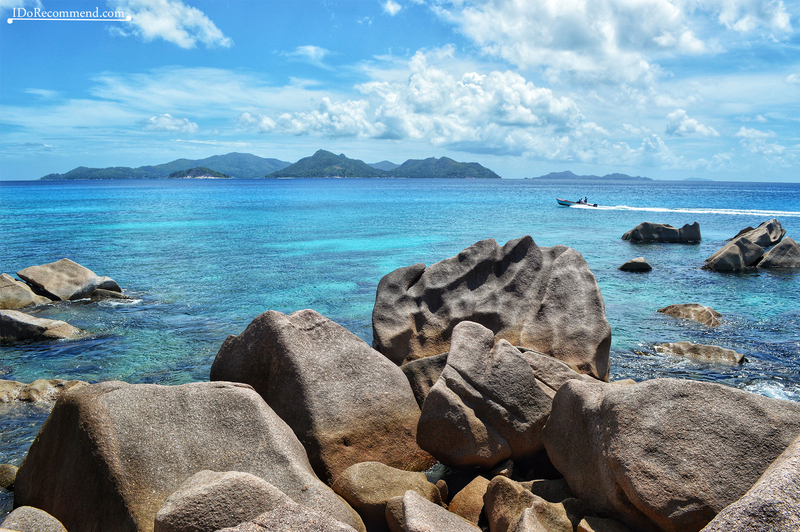 To arrive to La Digue island there are three options (mentioned down below). 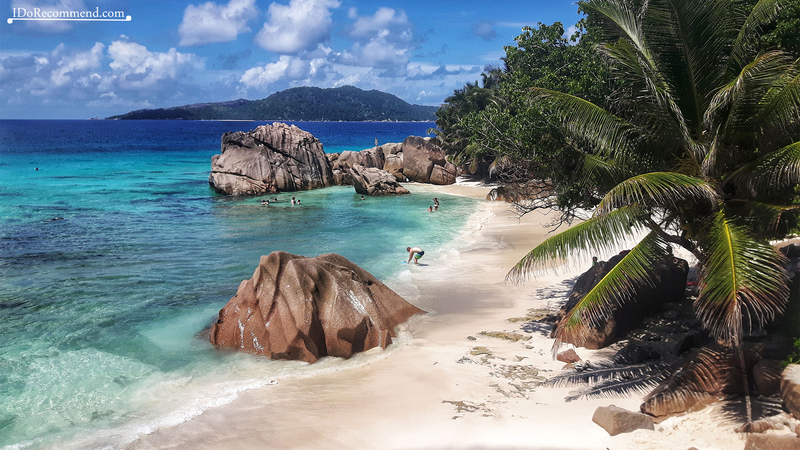 We chose the first one and the price was 122 euro/person in the main cabin for a round trip from Victoria jetty to La Digue Marina. 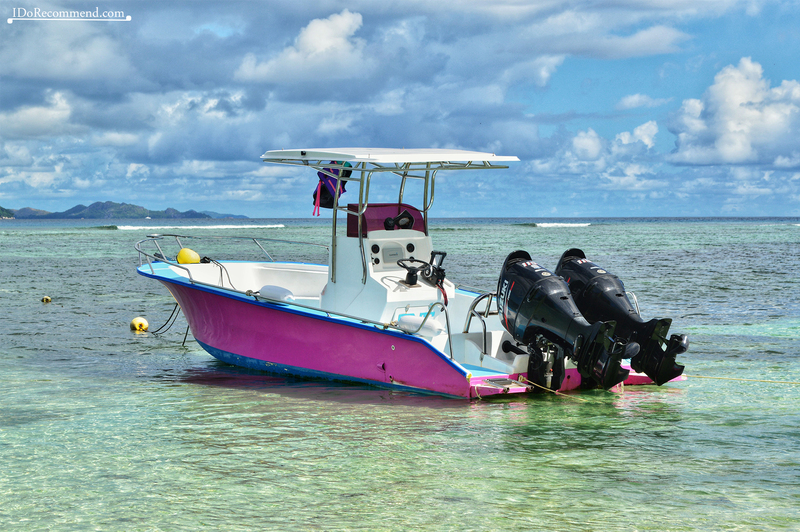 From the airport take either a shuttle bus or a taxi to get to Victoria jetty (on the same island, Mahé). Normally the bus is reserved only for people who arranged their trip through a travel agency, otherwise you must take a taxi (around 50 euro). 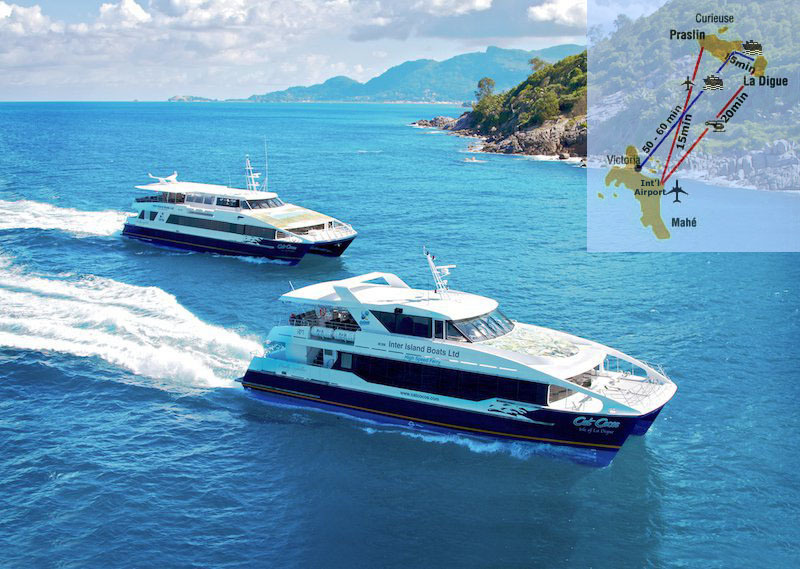 For travellers wishing to connect directly from an international or domestic flight to a ferry service, the local ferry operator, Cat Cocos, offers its passengers an airport transfer service between Mahé International Airport and the Cat Cocos jetty in Victoria (fees apply). Their shuttle bus leaves Mahé airport at 09:00 and 15:00 daily, as well as 08:00 on a Sunday, and must be booked in advance. 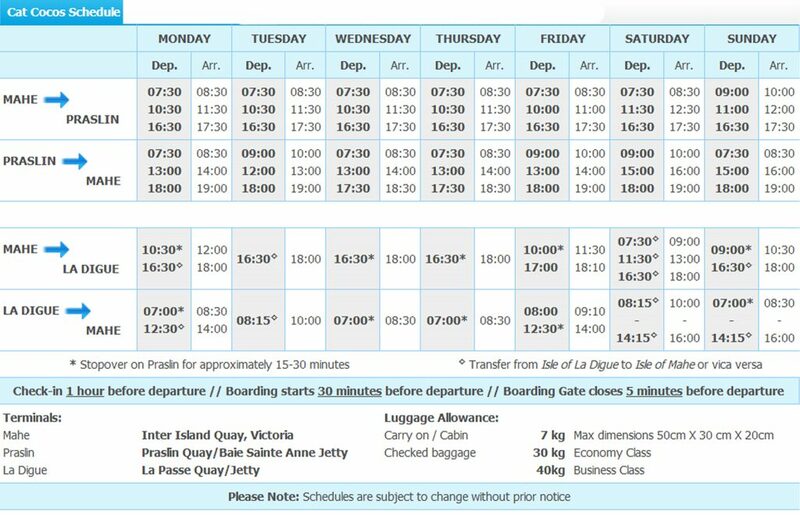 For early flight arrivals you can choose to either to stay at the airport and wait for the shuttle bus, or take a taxi to Victoria and wait there for your ferry departure. 2. 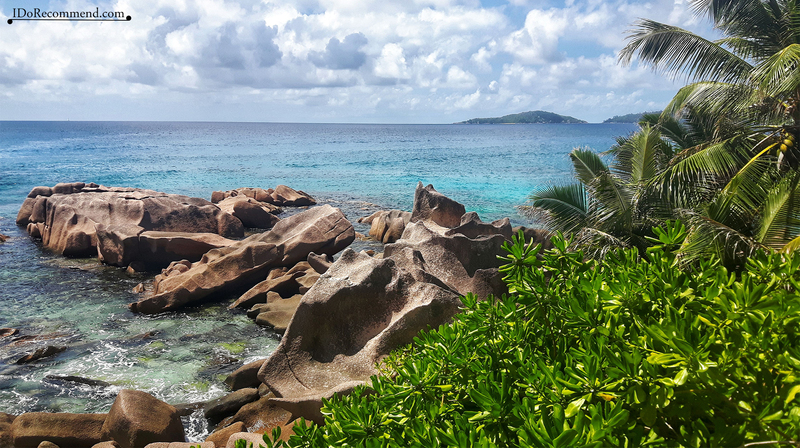 By airplane to Praslin (15 min with Air Seychelles), then by taxi/bus to Praslin Ferry Harbour and then by ferry to La Digue (15 min). 3. 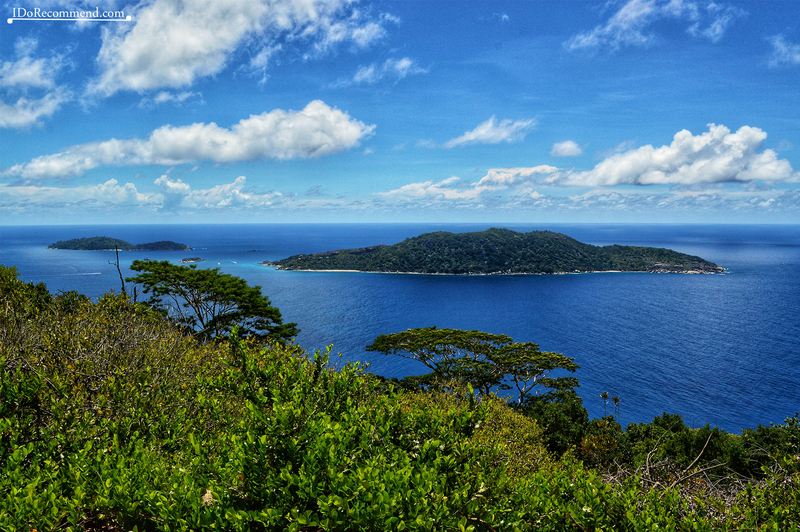 By helicopter directly to La Digue (20 min). 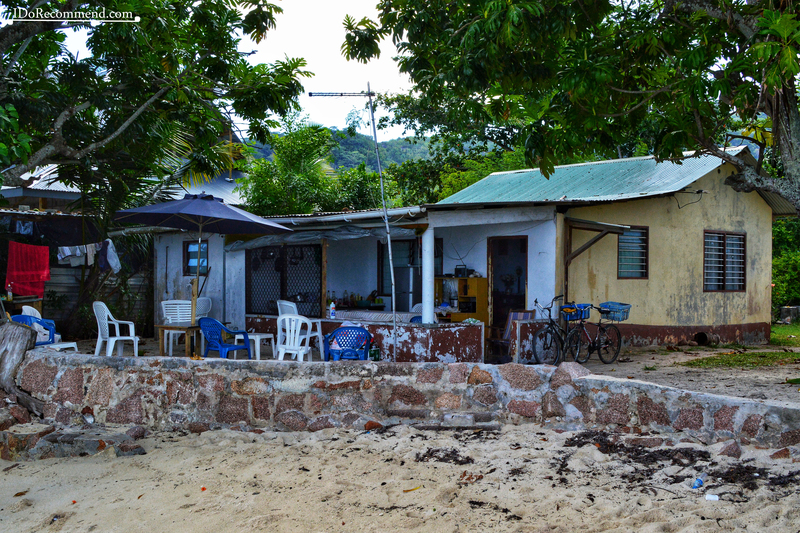 We stayed seven nights at the Rising Sun Guesthouse on the west coast of La Digue. 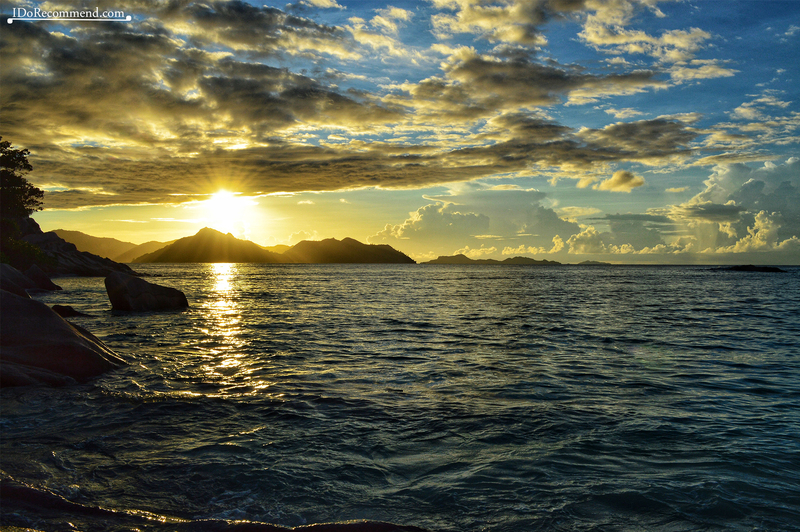 It was almost evening when we arrived on La Digue island after changing two airplanes, one bus and one ferry. It gets dark at ~18.00, so it was too late to explore the island and we were too exhausted after the long trip. The itinerary on that day was around 10 km long and the round-trip took us about 3 hours (it depends on how fast you go or how many stops you make). 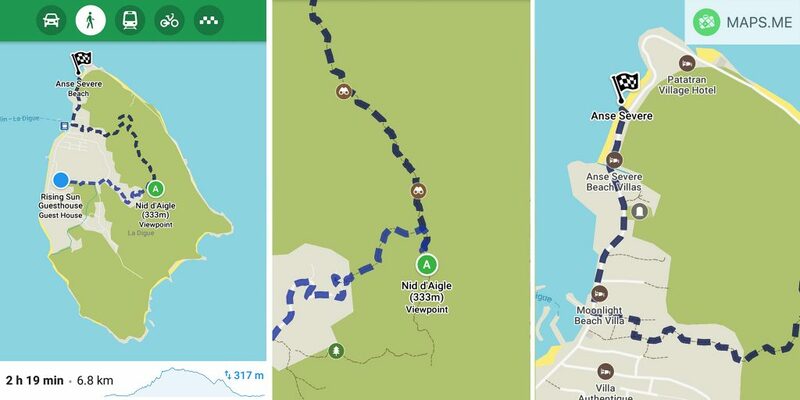 ADVICE – Download the offline maps from MapsMe in advance through a Wi-Fi connection as the data roaming rates are really high. 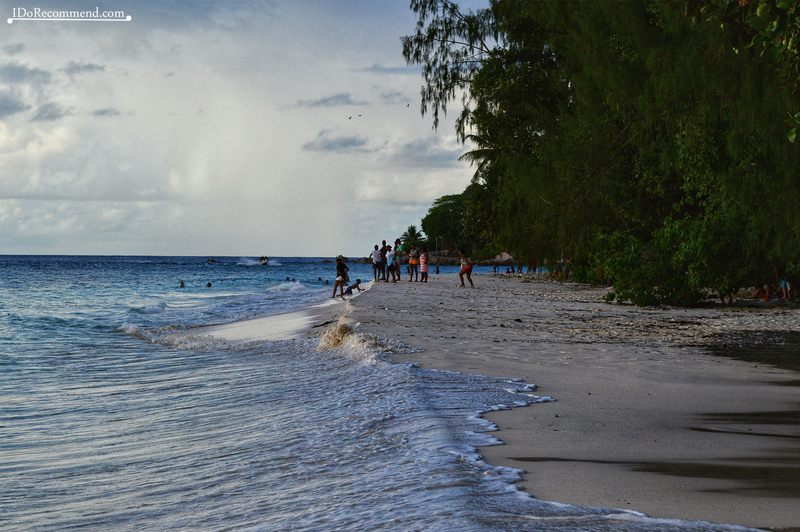 Anse La Réunion beach was not far from our guesthouse. 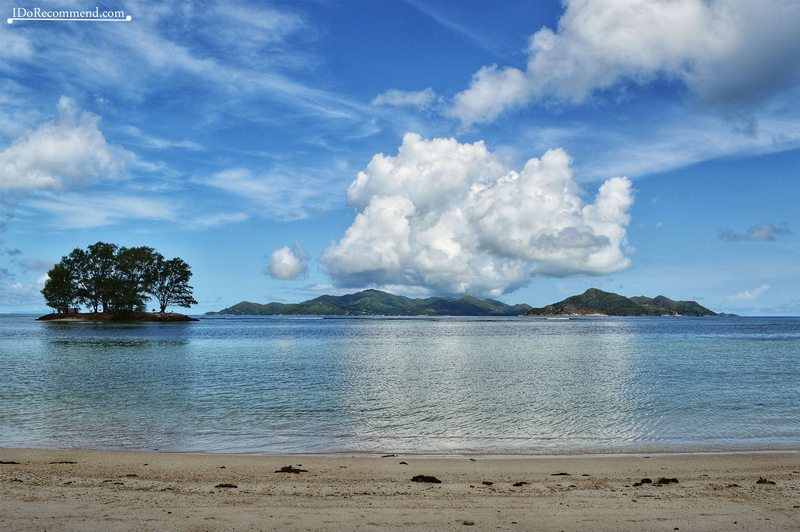 It’s a quiet beach, which is empty most of the time, except for the areas with accommodations found near it. 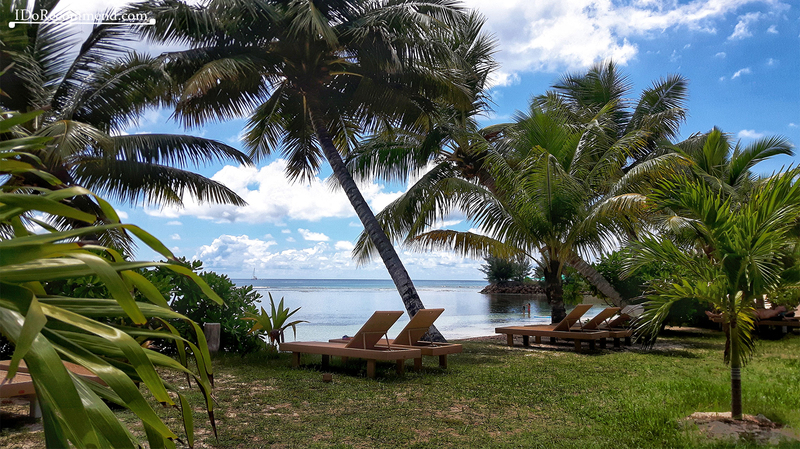 However, being a very long beach you can find a spot where you can stay alone, read a book, meditate or admire the beautiful scenery and the small sailing boats. 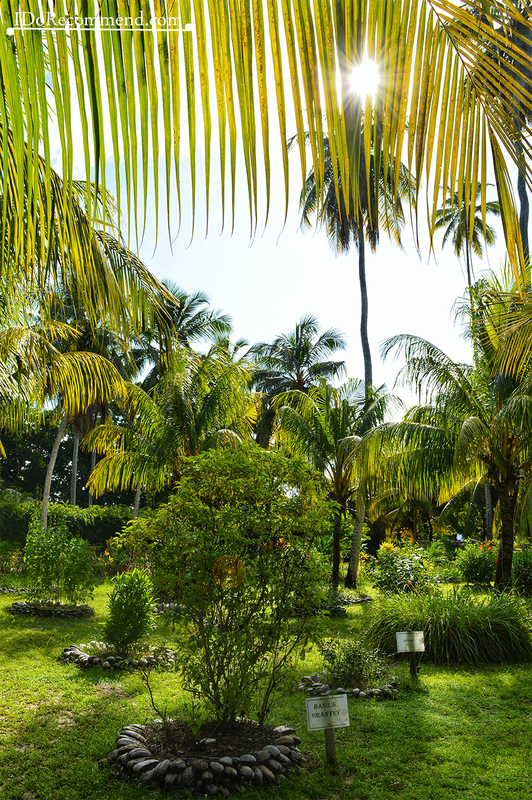 Right next to Anse La Réunion beach there is an amazing green place with small chalets. 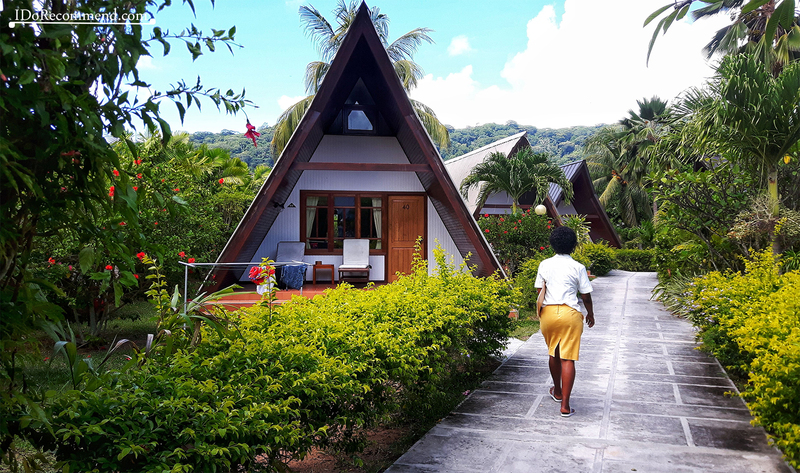 That place is La Digue Island Lodge resort. Its beachside setting makes it more special. 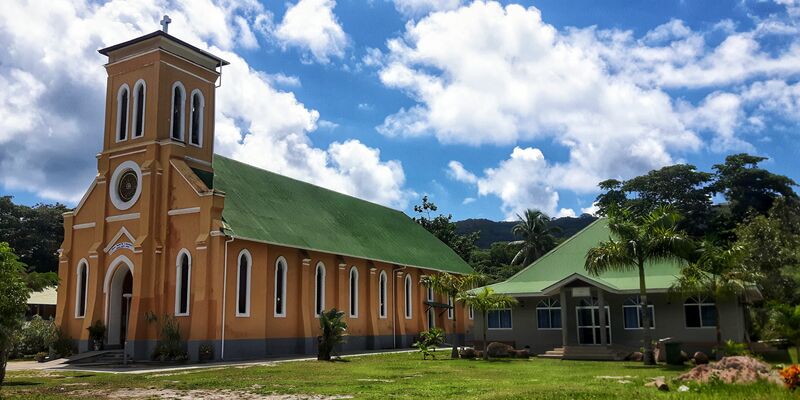 Notre Dame de l’Assomption is the only church found on the island. It is quite a big church painted in a very nice color. The interior is very simple and it has many wall mounted fans. 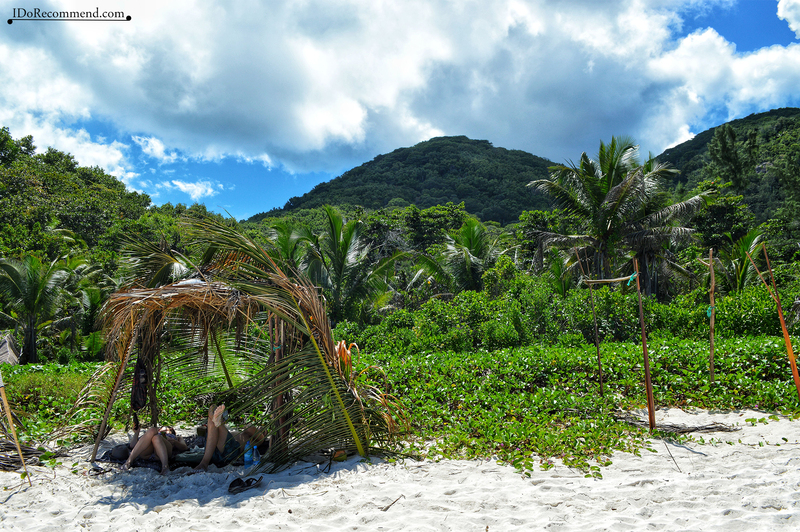 After crossing the island through its village, there is a tiny beach called Anse Songe. 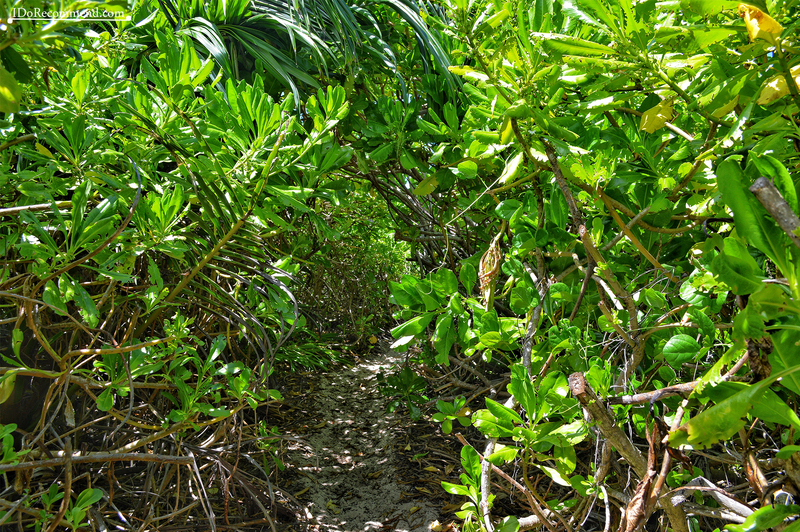 The path through this beach is very wild and covered with tall lush vegetation, but we felt safe without being with a guide. 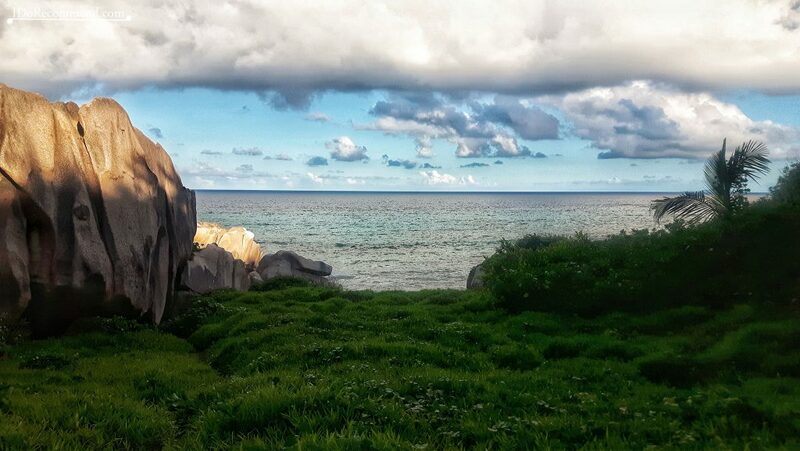 It was just amazing to see at the end of the path those huge rocks appearing behind the vegetation and revealing their well-guarded treasure: the Anse Songe beach. We loved that place the most because it’s so wild and it inspires peace. 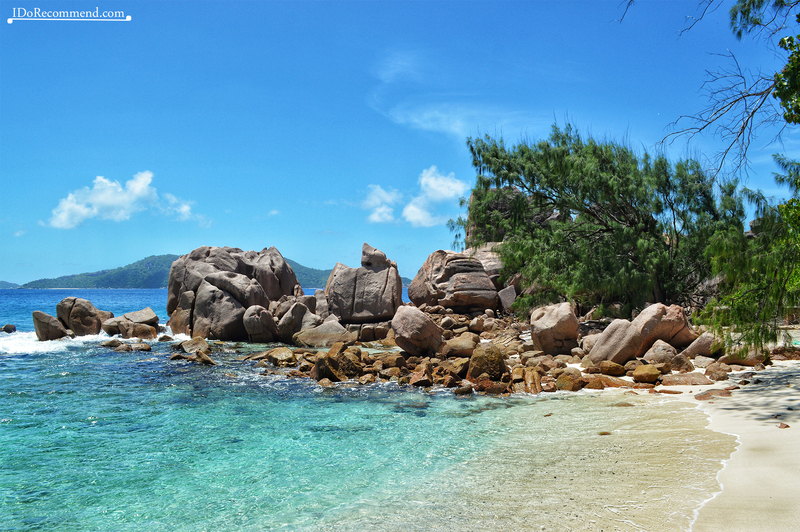 Next to Anse Songe there is Grand l’Anse Beach, as isolated as the first one. 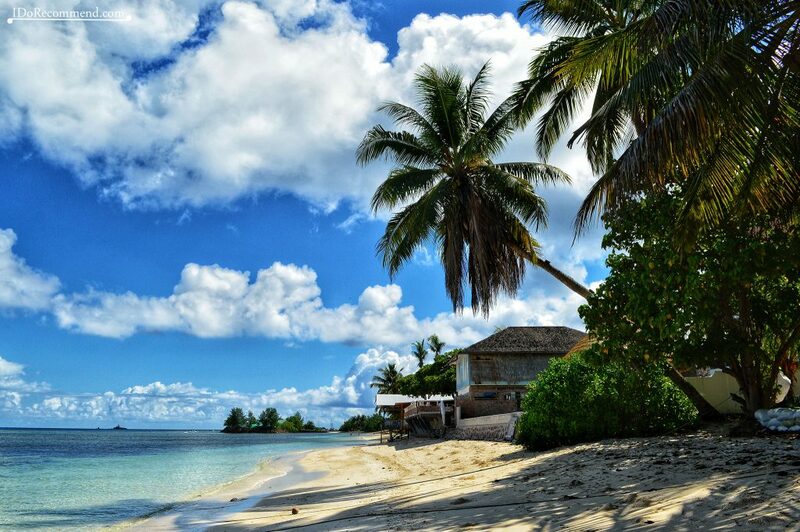 Those two beaches are worth visiting for their scenic views. 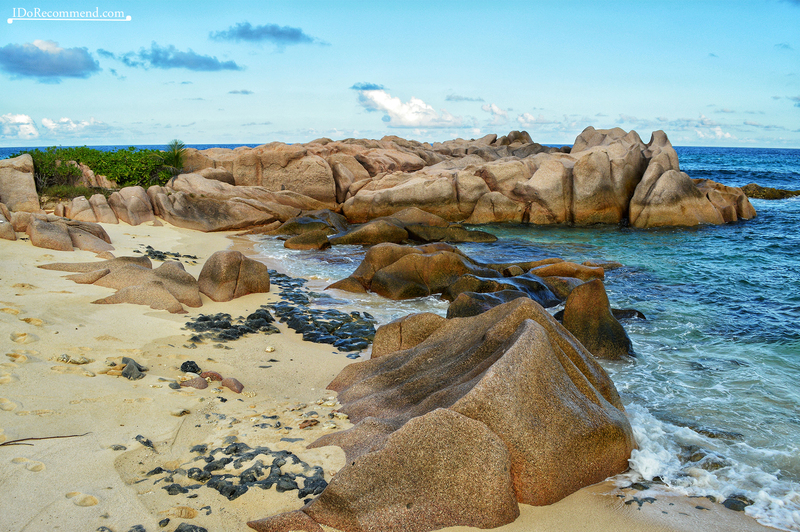 The water is rough, deep, with strong currents and full of stones, so swimming is not at all recommended. You can take some amazing photos at sunset. 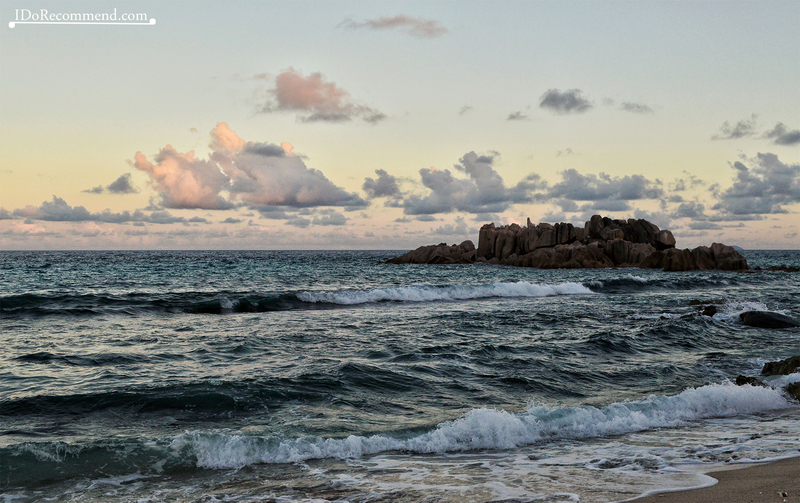 ADVICE – Make sure you leave Anse Songe and Grand l’Anse before 18.00 when it is getting dark. There is no public light and you have to pass through abundant vegetation to get to the main road. Take a headlight with you, just in case. The itinerary on that day was around 13 km long and the round-trip took us about 3.5 hours. 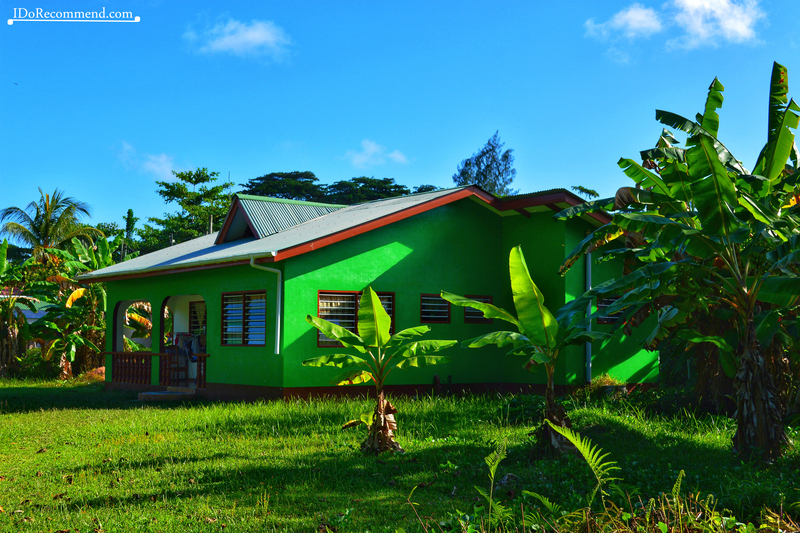 L’Union Estate is a National Heritage of La Digue. 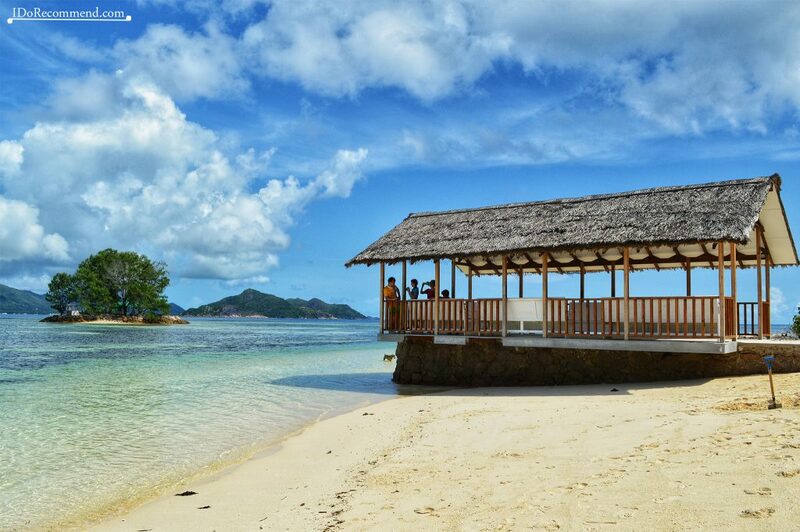 We paid 115 Seychelles Rupees to enter the estate in 2017. 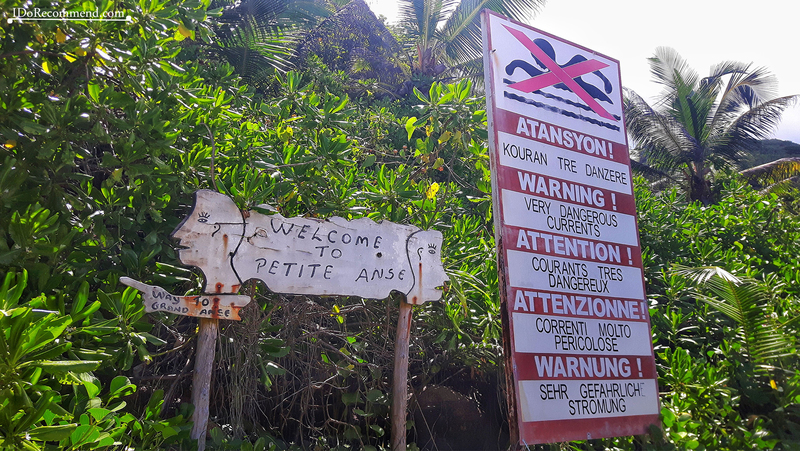 Some people complain about the entry fee and decide to access the famous Anse Source d’Argent beach for free by walking or swimming near the shore. 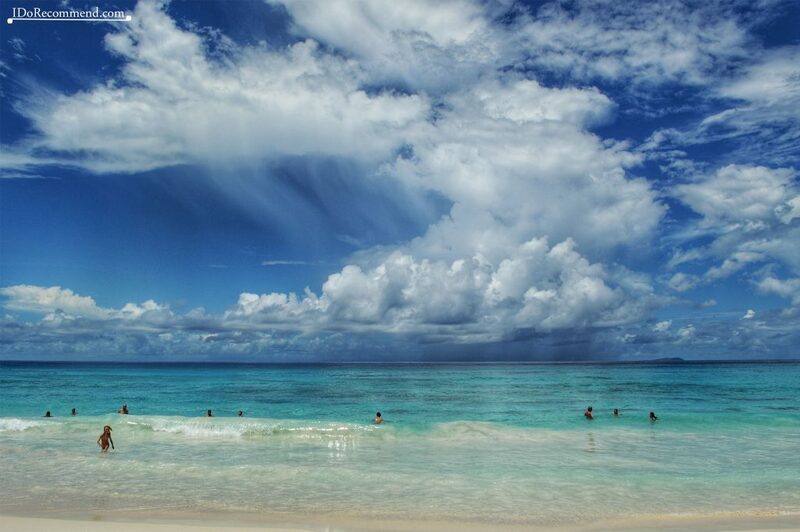 However, as there are parts without beach and without shade, the fee is worth it. 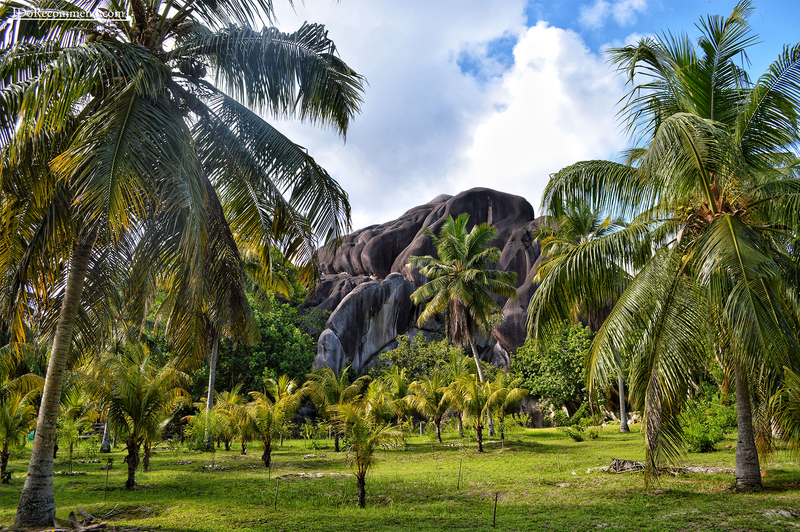 In that park we saw the Coconut plantation, the Giant Tortoises, the Anse Union beach and one of the most famous and photographed beaches in the world, Anse Source d’Argent. 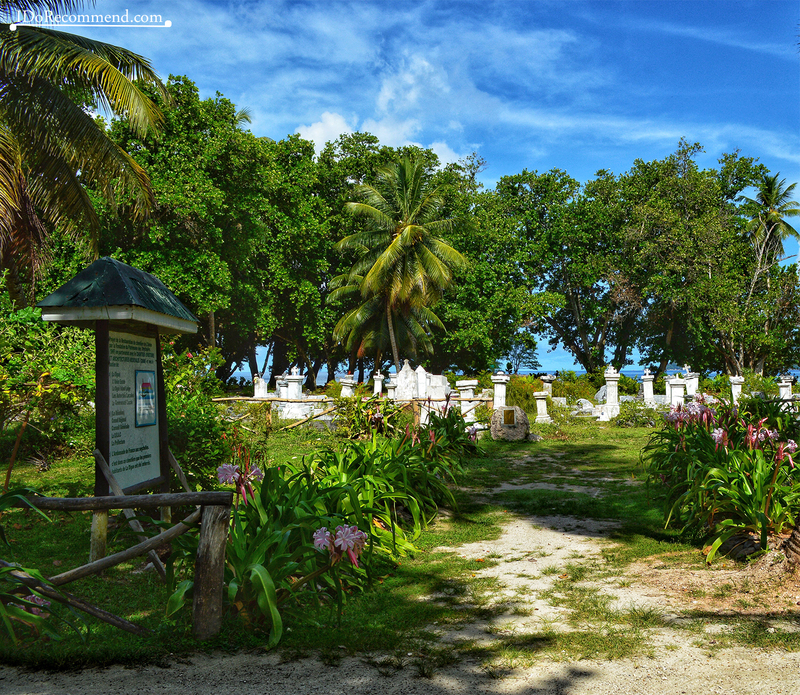 There is also an old colonial cemetery where the first settlers of La Digue are buried. We loved the most the granit rocks that make the park look absolutely spectacular and unique. 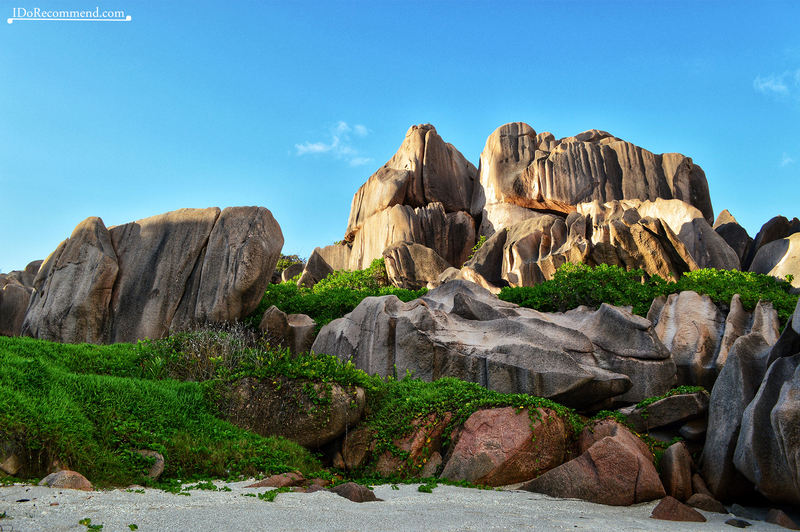 The Giant Union Rock occupies an area of 4,000 m² and it is estimated to be around 700 million years old. 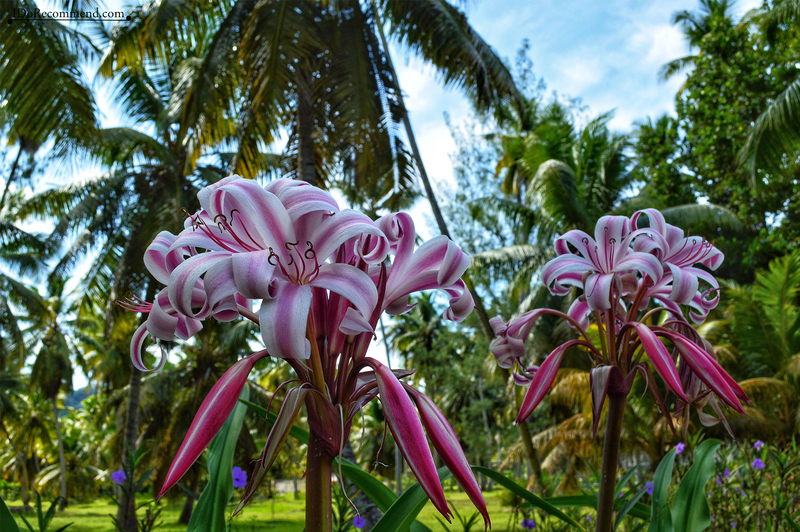 before palm oil conquered the world market, coconut oil had, for centuries, been the natural product widely-used in the kitchen. 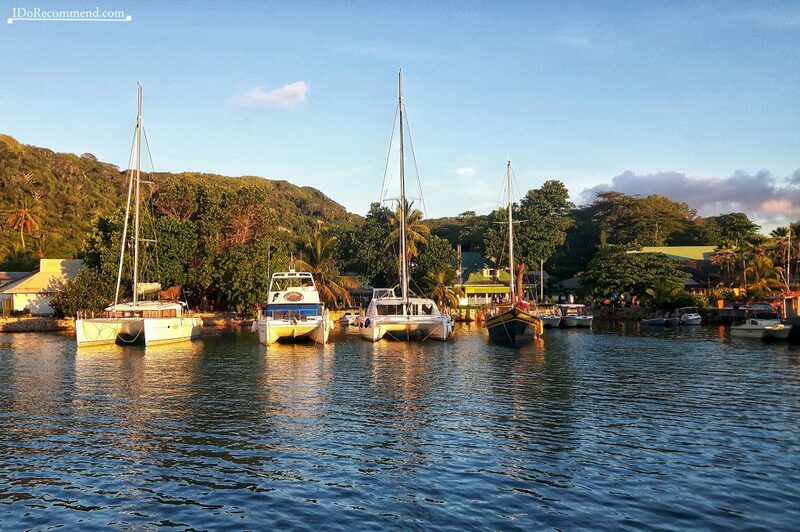 Intersecting La Mare Soupape river, Anse Union is not as famous as its neighboring beaches. 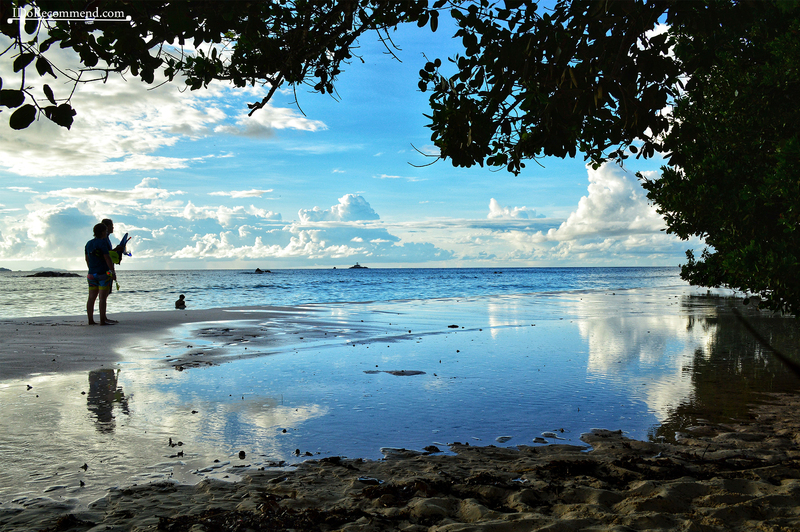 Nevertheless it is a nice and quiet place and a family-friendly beach with shallow water. 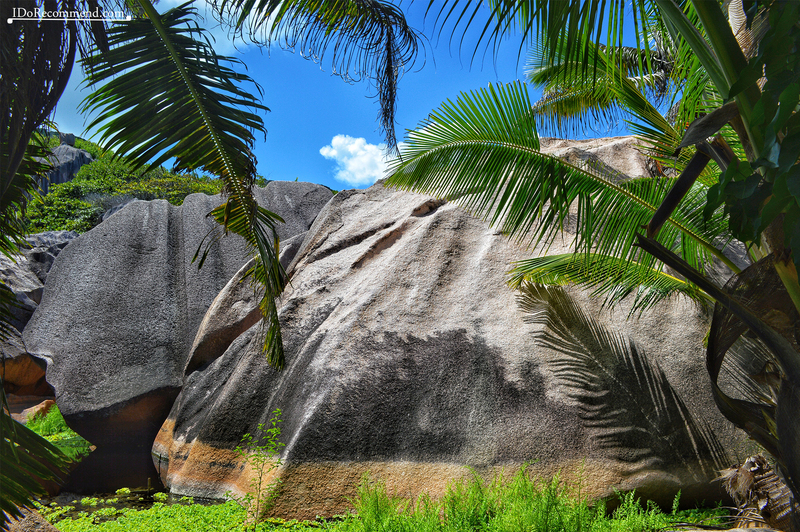 Anse Source d’Argent beach is more crowded, but more spectacular because of the impressive boulders, the abundant lush vegetation, the pristine white sand and the turquoise ocean that blend in perfect harmony. 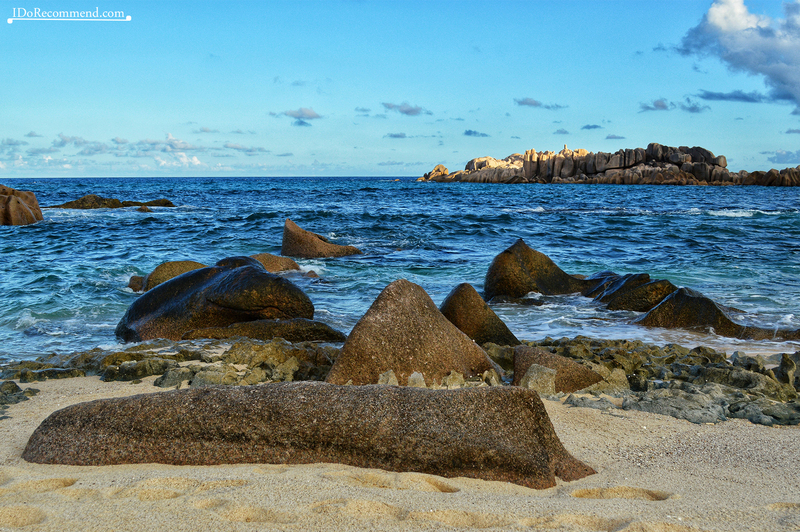 Some of the towering granite rock formations flank the beach and others found near the shore are gently touched by the crystal-clear warm ocean. 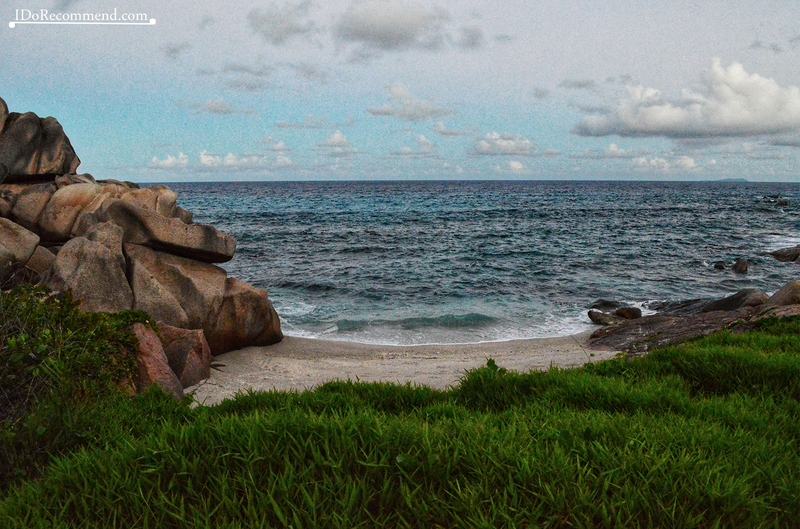 Right where Anse Union meets Anse Source d’Argent there is a small place, hidden by the rocks, with white fine sand where couples get married. 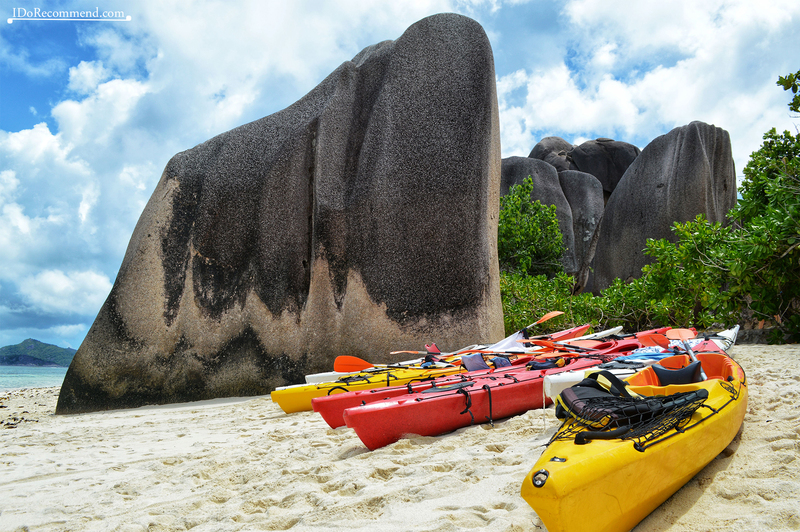 Crystal Water Kayaks is an ecological kayaking business offering guided tours in 100% transparent kayaks. 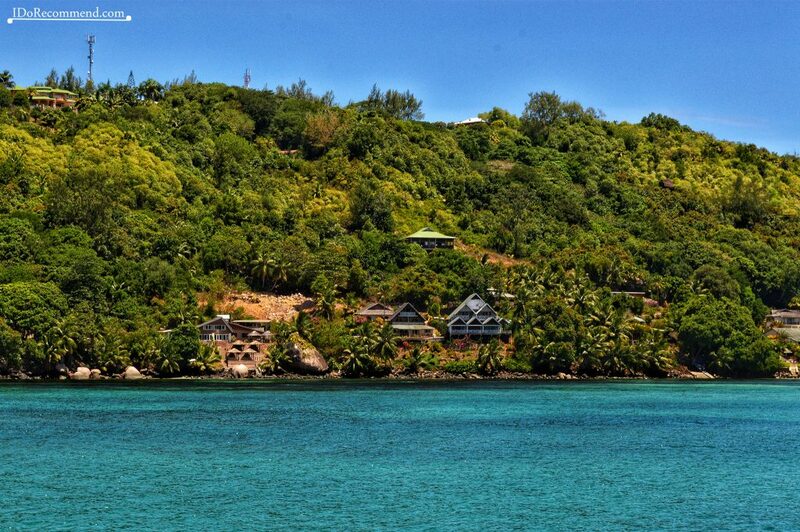 They are located on the beautiful shores of Anse Source D’argent. 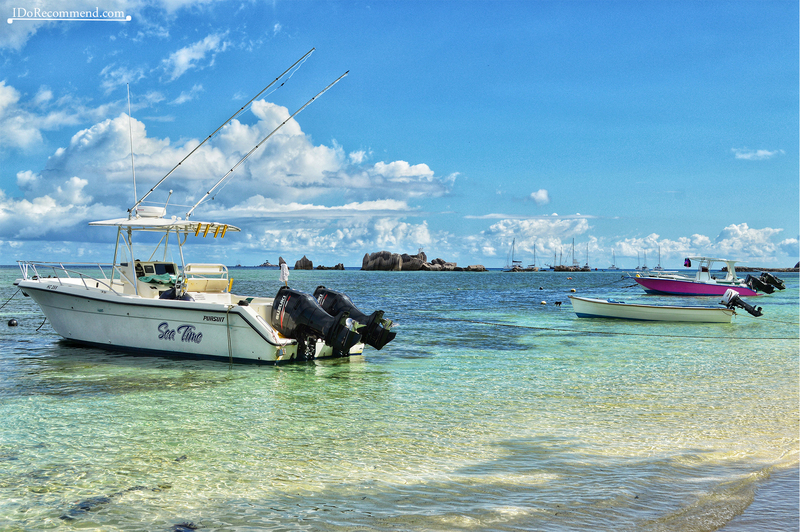 The tours allow visitors to discover and explore the marine life while enjoying breathtaking scenery and panoramic views of the coastline. 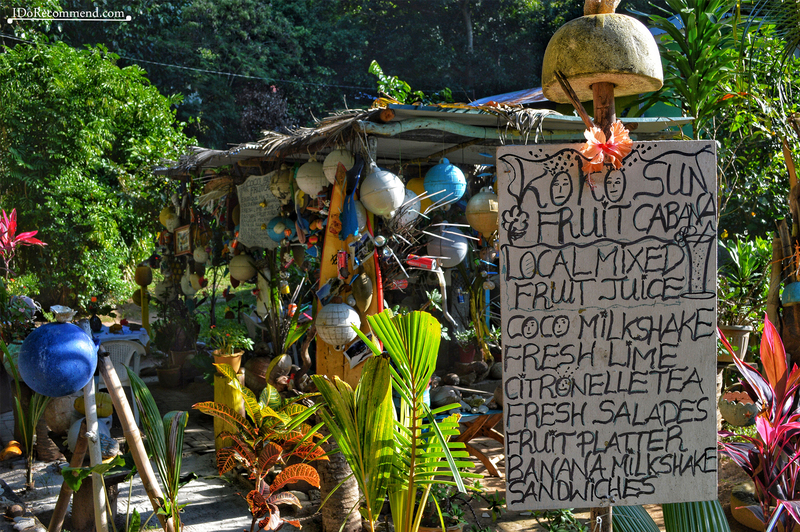 Following the trail up ahead from Anse Source d’Argent, there is Fruita Cabana Bar where you can order some delicious fruit smoothies. 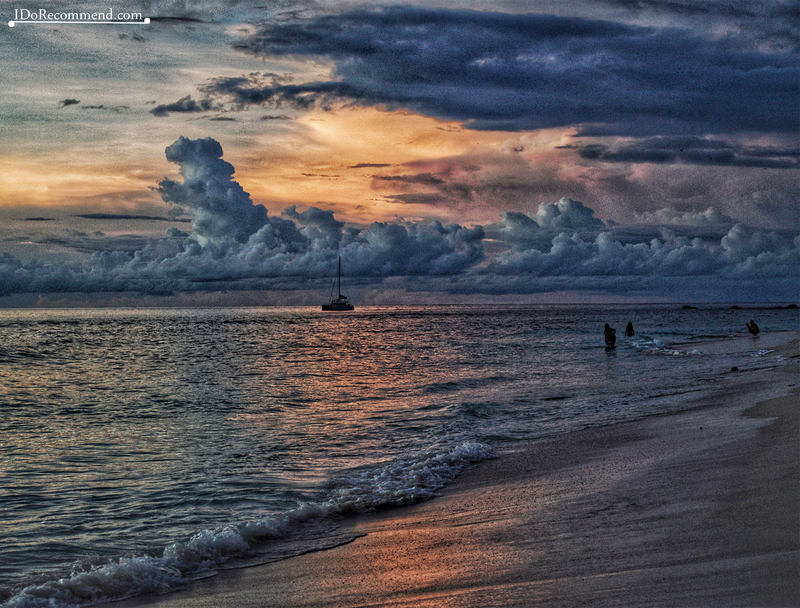 For us the most amazing place from La Digue to watch a sunset is Anse Severe beach. 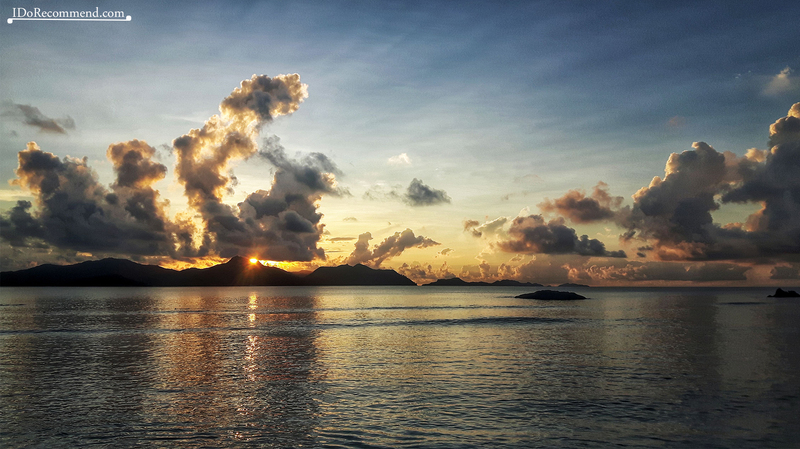 The sun has sunk behind the hills of Praslin island being accompanied by the clouds in a burning red. 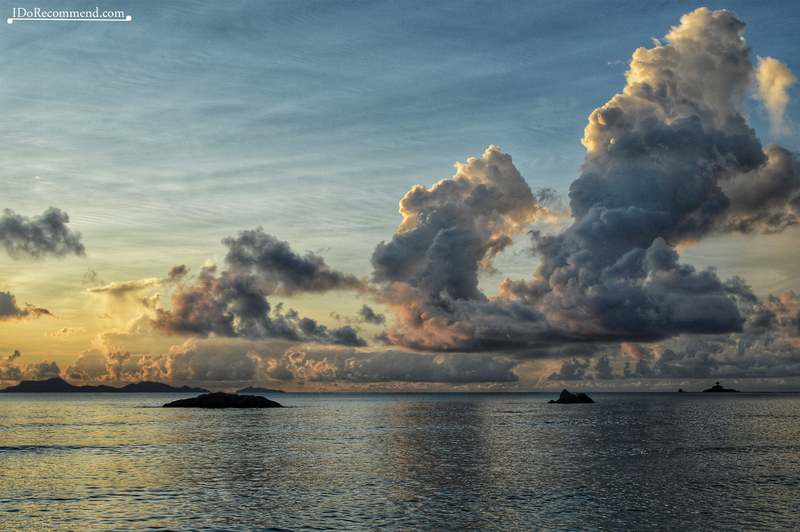 When the sun finally has felt asleep below the horizon, the fleeting colors of dusk have begun to fade away and the clouds’ silhouettes have started to fly across the sky in spectacular shapes. The itinerary on that day was around 10 km long and the round trip took us about 3h. 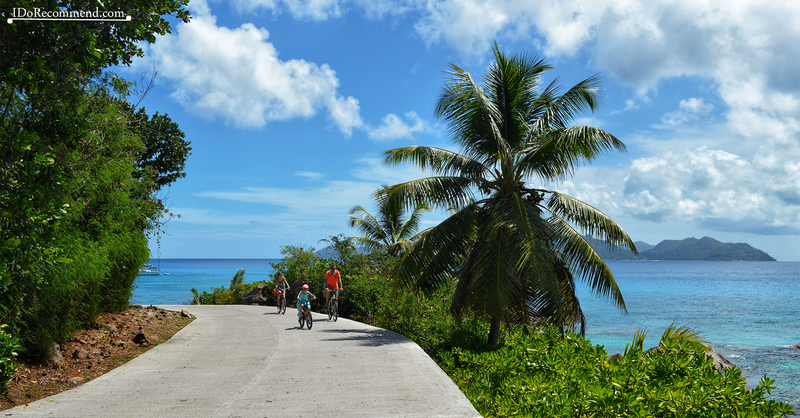 ADVICE – When going to/coming back from Anse Cocos choose the path that passes by Grand Anse. Don’t try to use other paths because they are unmarked, not cleared of growing branches, difficult and you may get lost in the dense jungle. 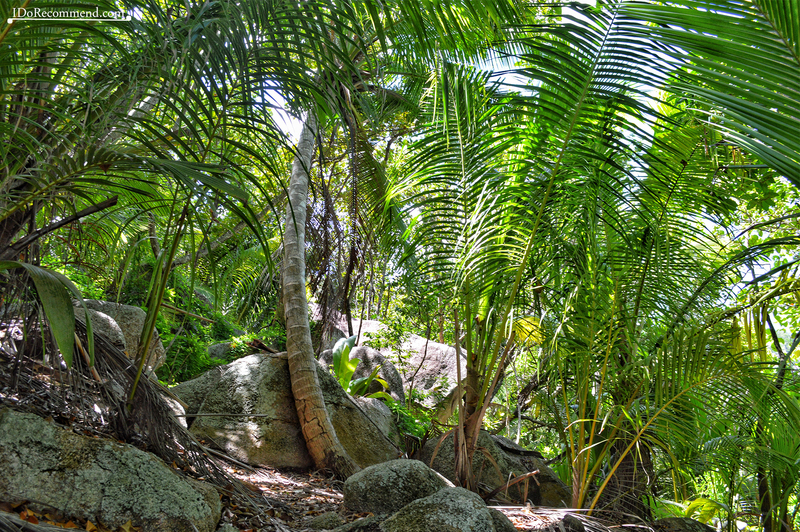 The Veuve Reserve is a small nature reserve which offers a lot of natural shade from the trees. It can easily be explored with little danger of getting lost. 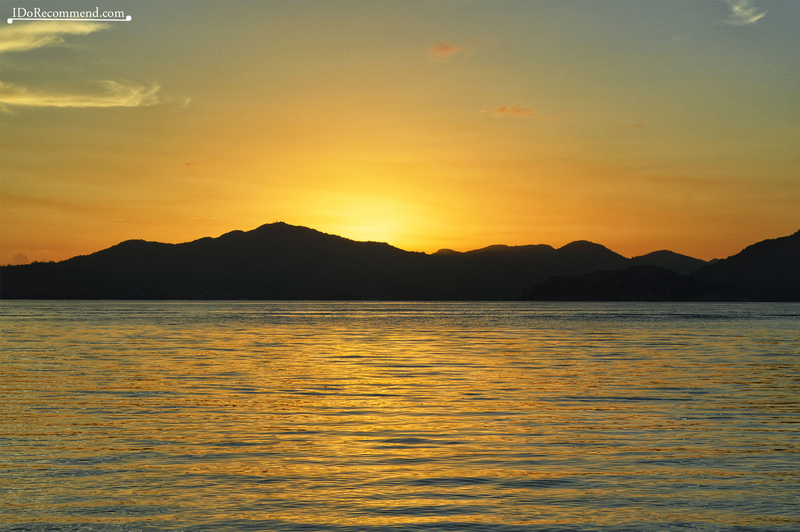 ADVICE – The Veuve Reserve is home to mosquitoes, so bring insect repellent. 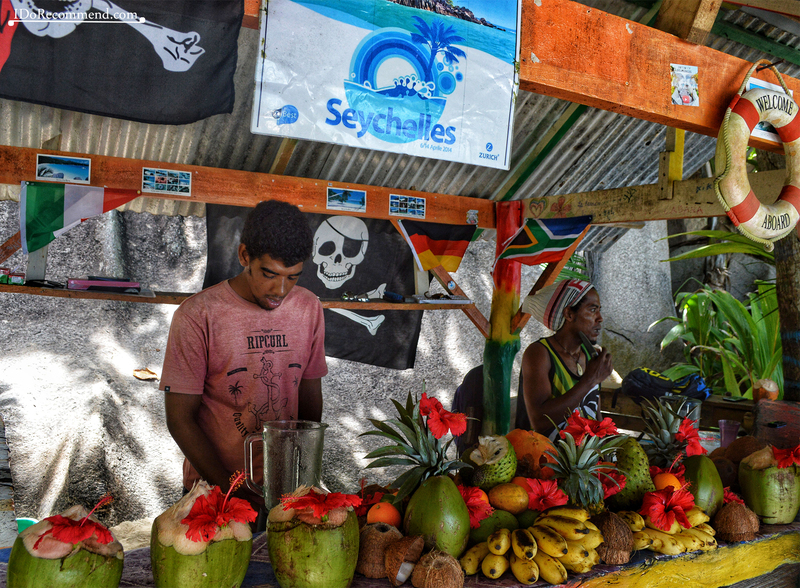 If you ever arrive in the Seychelles, on your way to Grand Anse beach visit the Coco Sun Fruit Cabana outdoor bar. 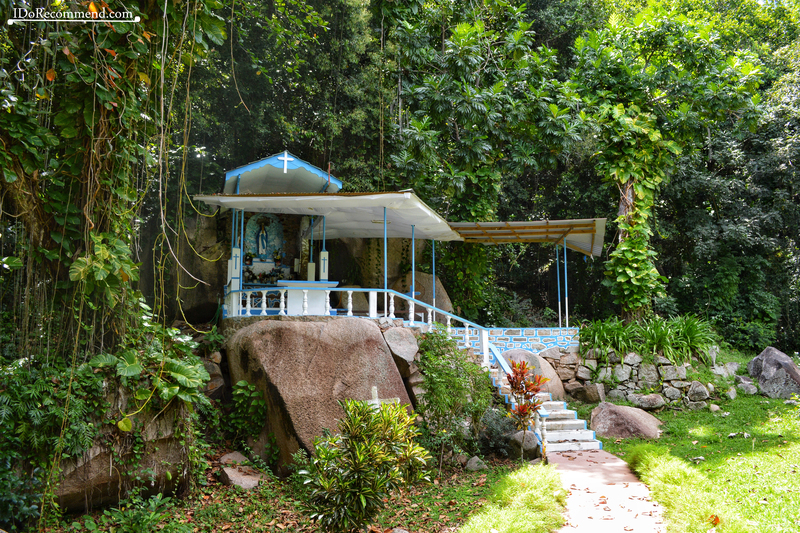 You will recognize the place by its unique decor and atmosphere (incense sticks and good music). 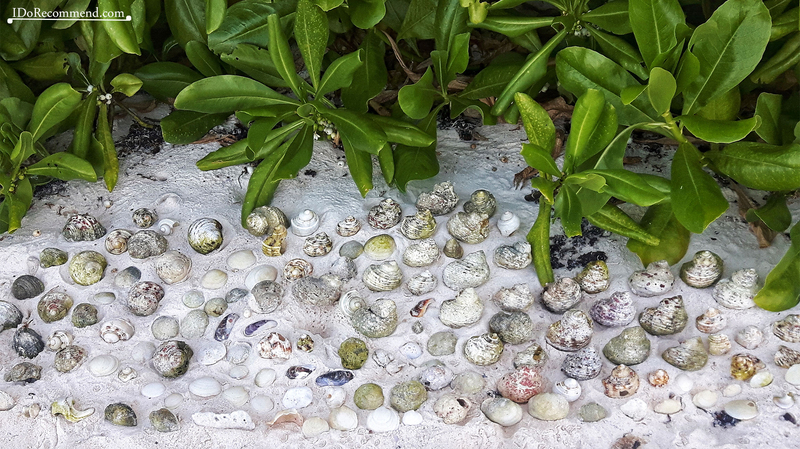 A guy in his late 20s has collected the trash found on beaches near his home – cans, shells, sunglasses, flip flop soles, plastic straw etc – and has used it to decorate his own outdoor bar where he sold fresh juices and fruit platters. 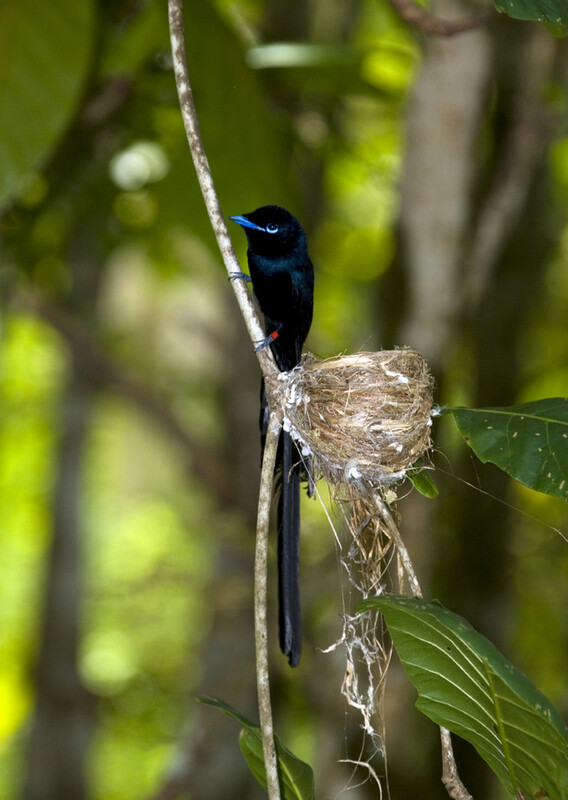 He has been very ingenious by finding a source of living and at the same time protecting the environment. Great job, young man! 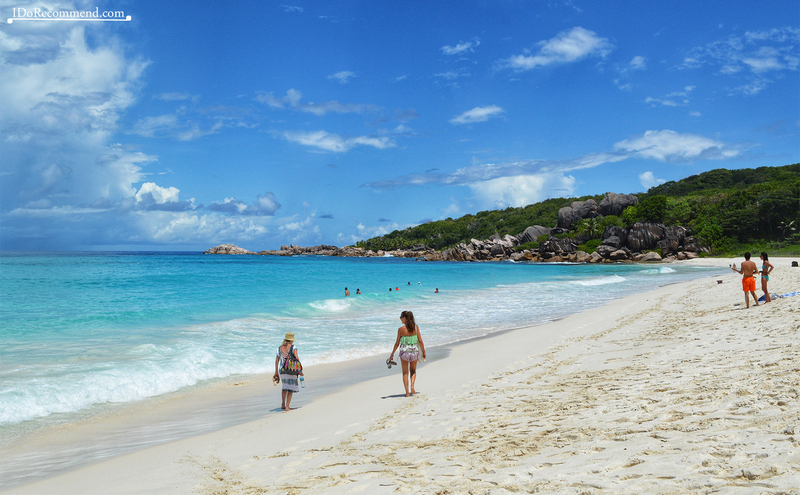 Grand Anse beach amazes the tourists by the clear water which is in perfect harmony with the pristine golden-white sand. However, in that area it may be very dangerous to venture into the rough ocean. 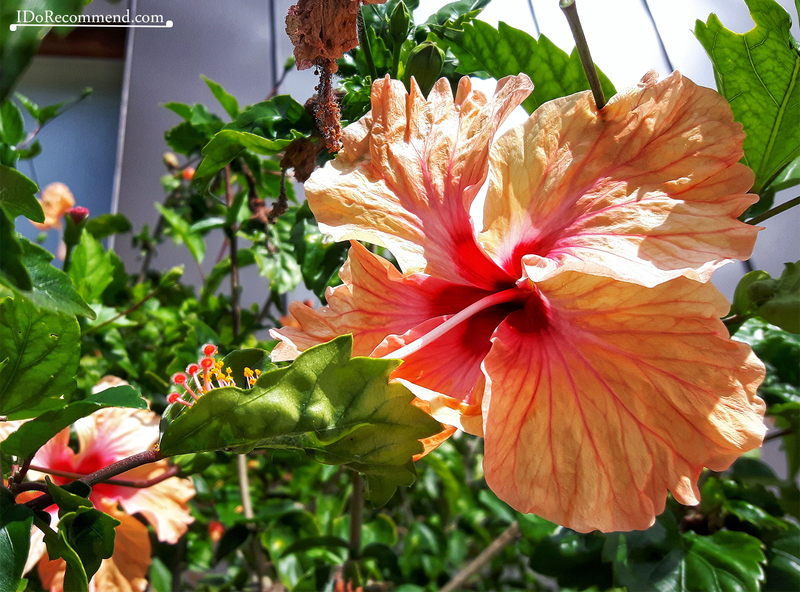 Moreover, there is not much natural shade, so it is very exhausting to stay a long time under the strong sun rays. 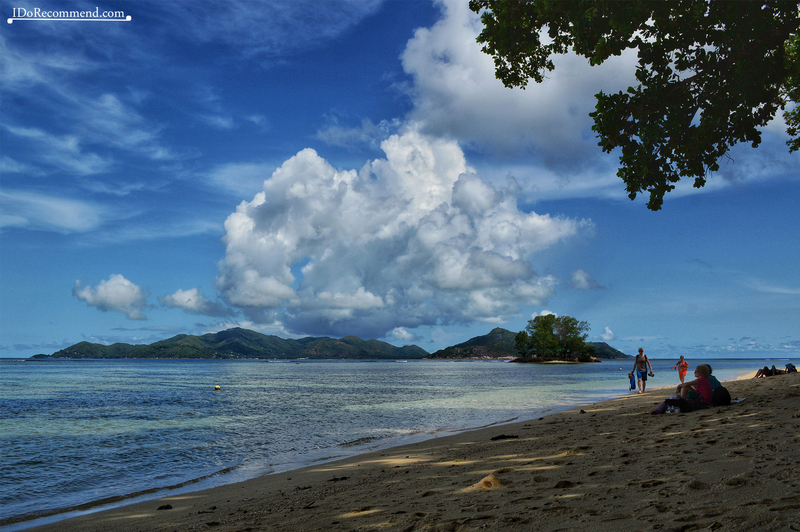 15 minutes walking from Grand Anse there is a similar, but quieter beach, Petite Anse. 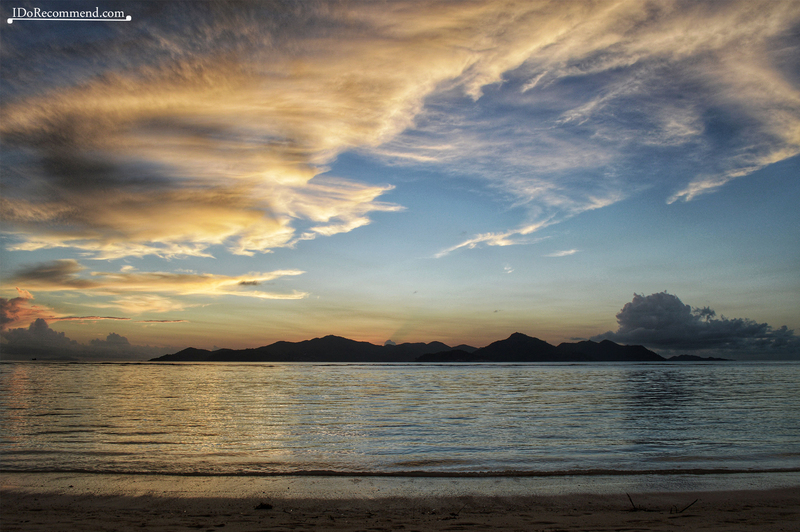 It has a peaceful atmosphere and the scenery is breathtaking. 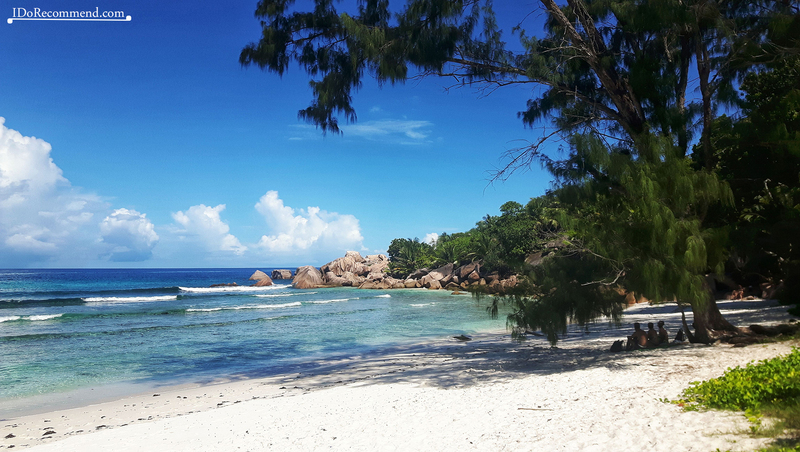 The third beach, Anse Cocos, stole our hearts due to its shallow natural pool that are hidden by the typical Seychellois granite boulders at the north end. 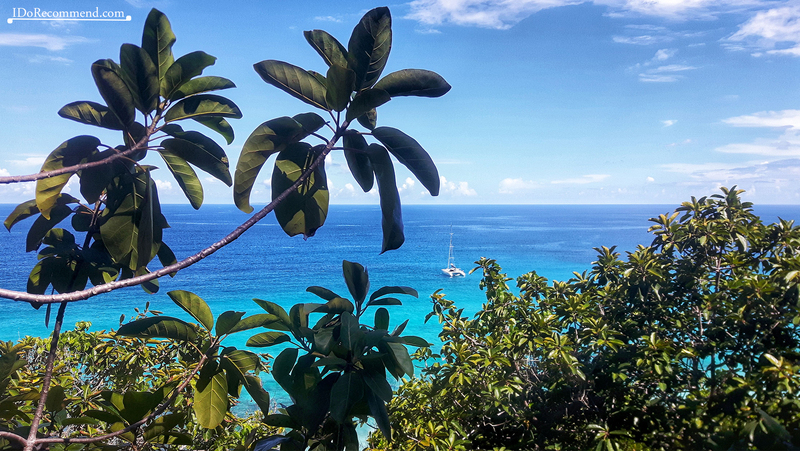 To reach this beach you have to take the beautiful jungle trail that starts from Grand Anse and passes through Petite Anse. 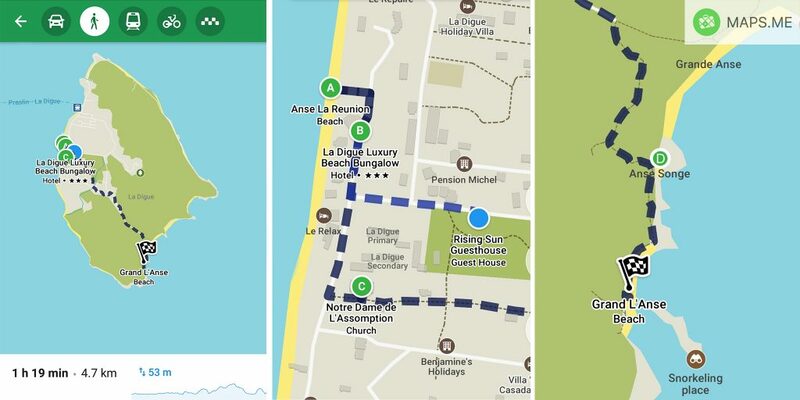 The trail takes about 45-60 minutes, depending how many stops you make at the other beaches. You can buy a guided tour to get there. 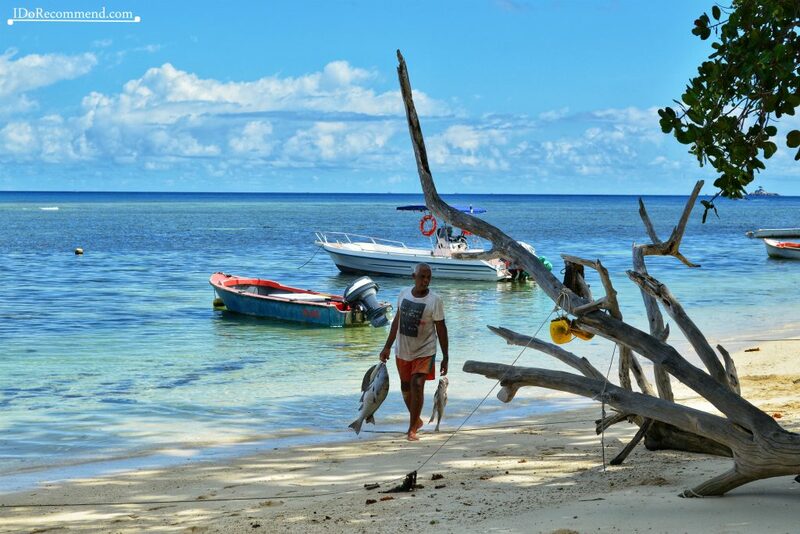 Robert Agnes is a pretty well-known guide on La Digue. However, we recommend you to walk by yourself, the path is quite easy and you can find other people during the hiking to ask for help. 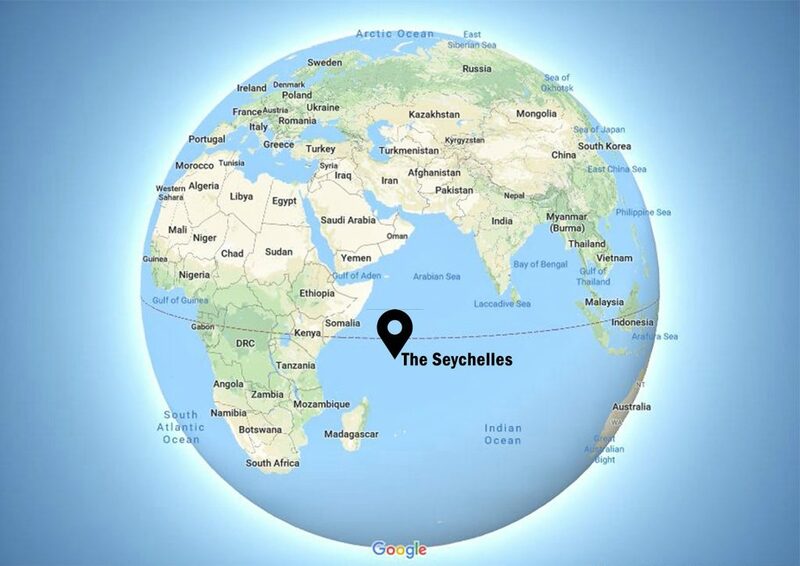 Watch the video below realized by Seychelles.cc to get familiar to the trail from Grande Anse to Anse Cocos. The itinerary on that day was around 12 km long and the round trip took us about 3.5h. 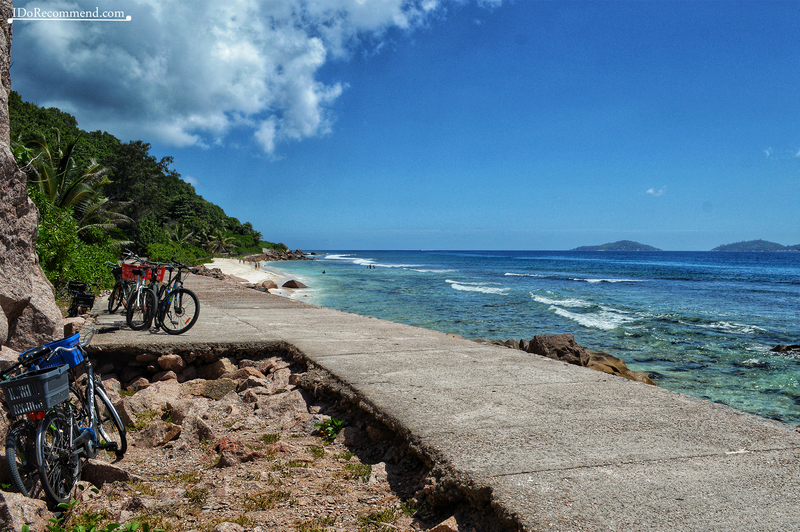 The northern coast of La Digue is most-often traversed by bike. 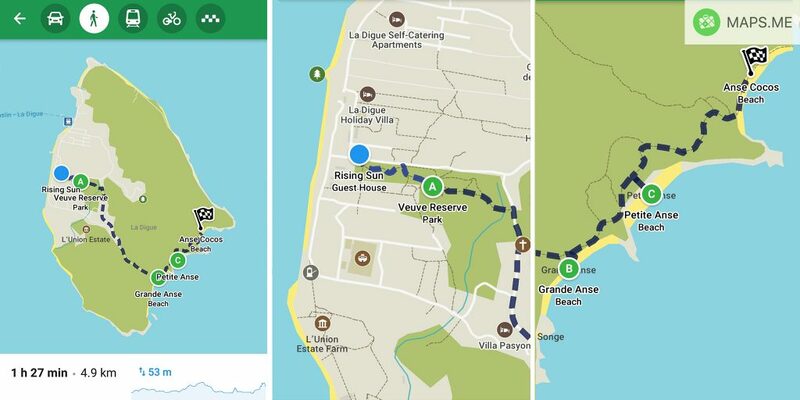 There is a small concrete paved path running parallel to the beach and going until Anse Fourmis. 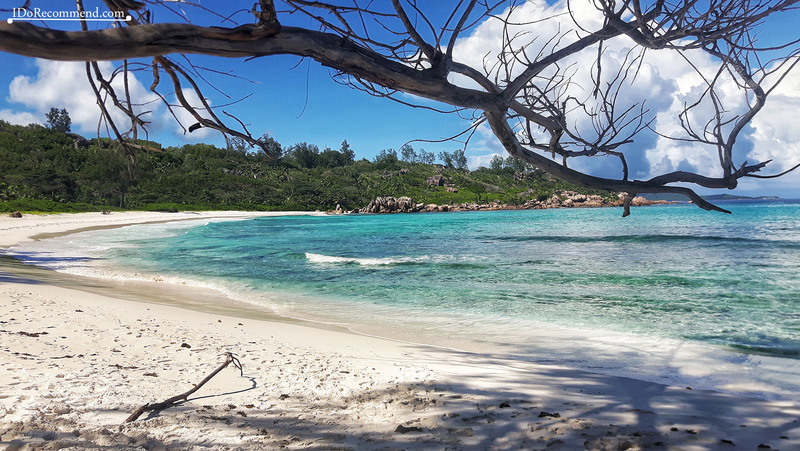 Going to the north you will first reach the picturesque beach of Anse Severe that faces the Seychelles’ second largest island, Praslin. 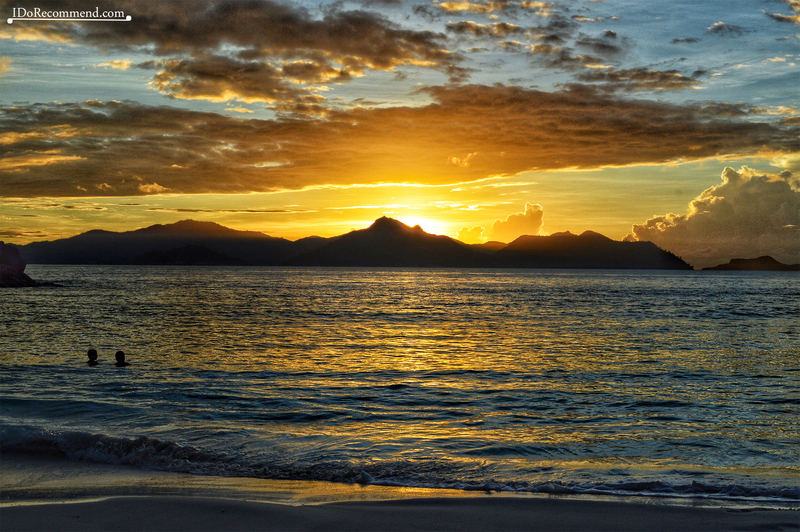 This beach offers a spectacular sunset views over Praslin. 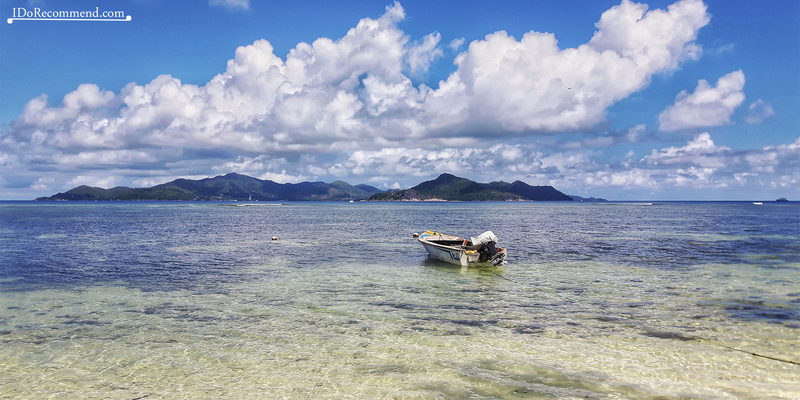 There are a lot of local people coming on the beach in the afternoon, just before the sunset, to admire the scenery and spend some nice moments with family and friends. 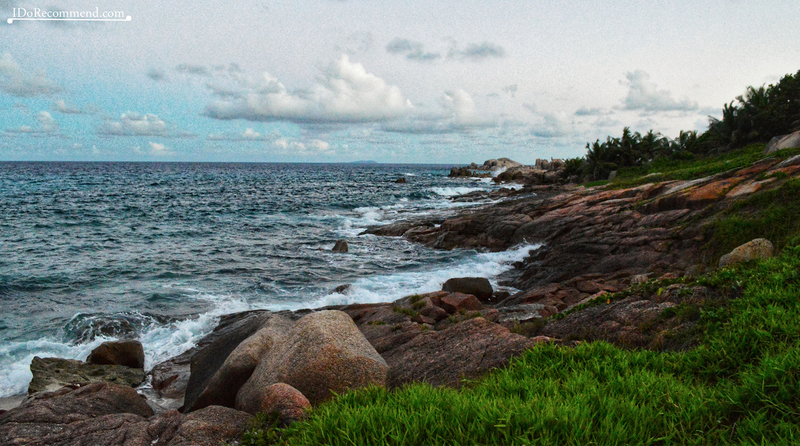 Heading further along the coast there is the next beach, Anse Patates. 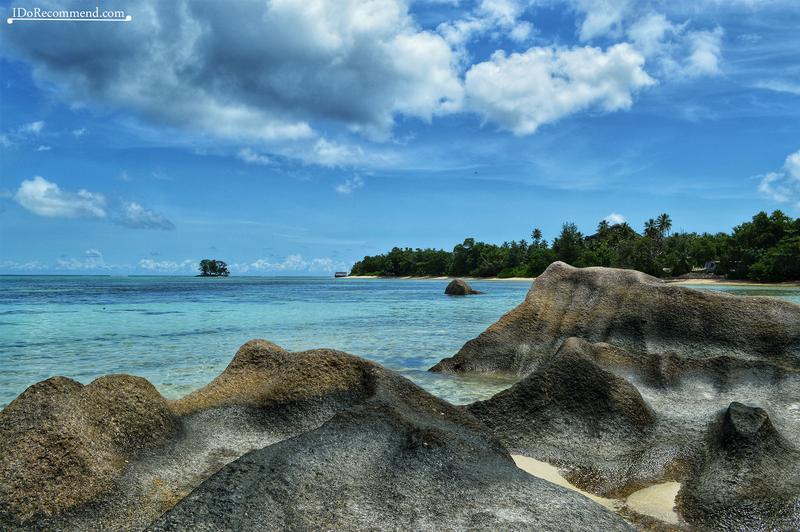 The big rock formations found on the beach and the turquoise water transform the scenery into a spectacular one. 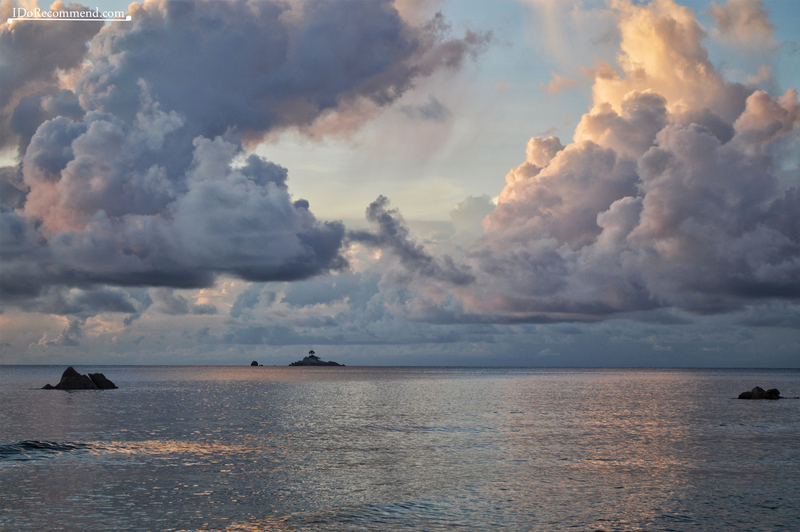 However, the ocean might be very rough, with high waves so it’s better just to admire the view and take photos. 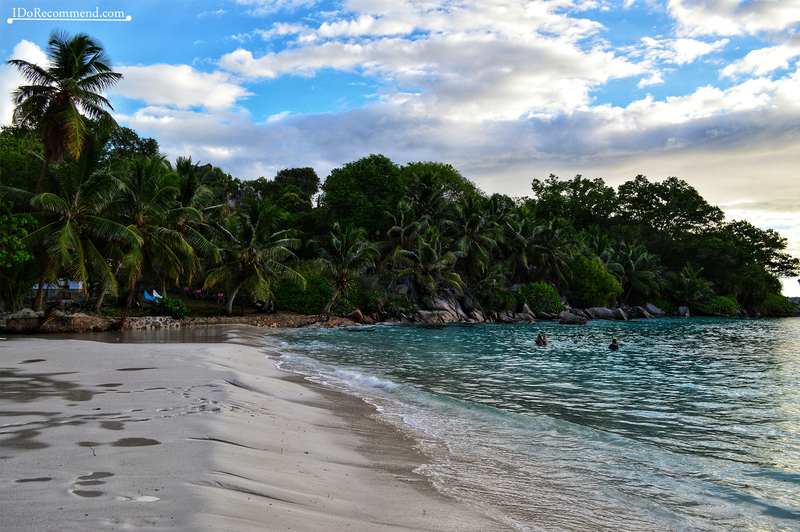 Anse Gaulettes is a very narrow beach, pretty isolated, but peaceful place. Next to it there is an art gallery. 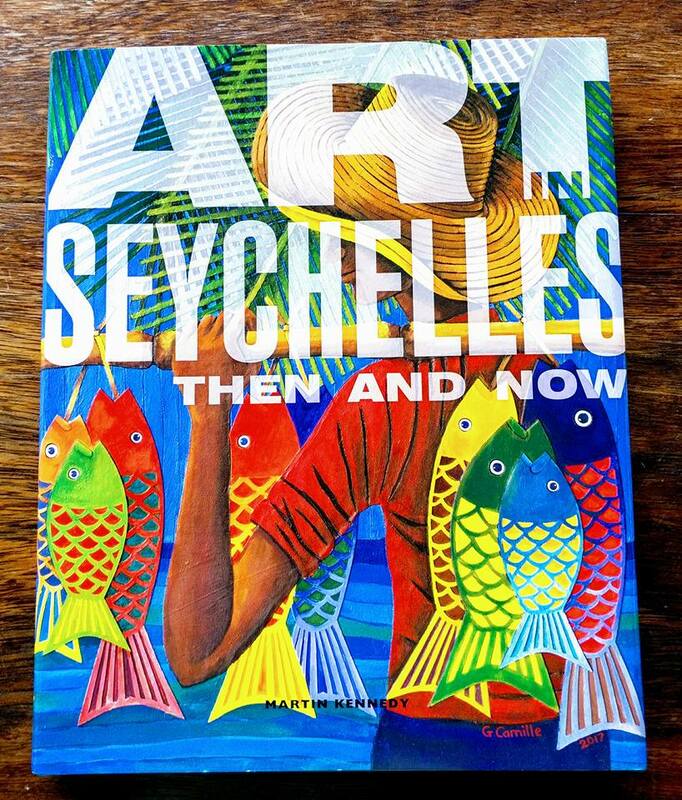 The author of the paintings, George Camille, was born in the Seychelles, but he studied at a college of art in London. 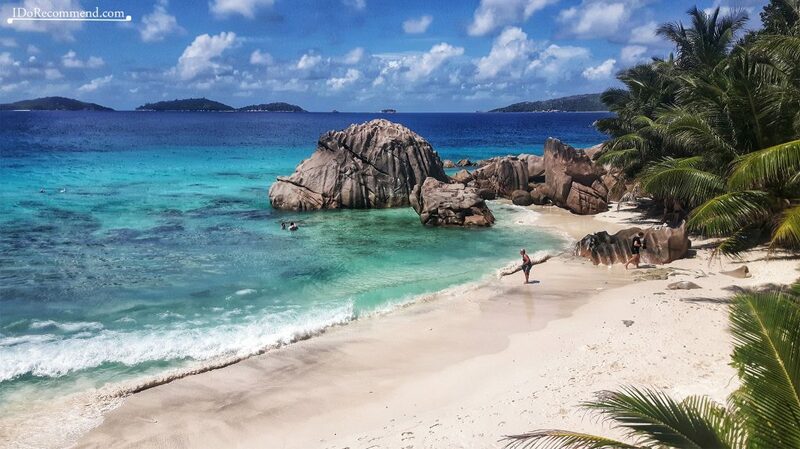 Further south there is Anse Grosse Roche with its large boulder that was used in the 1987 film ‘Crusoe’, starring Aidan Quinn. 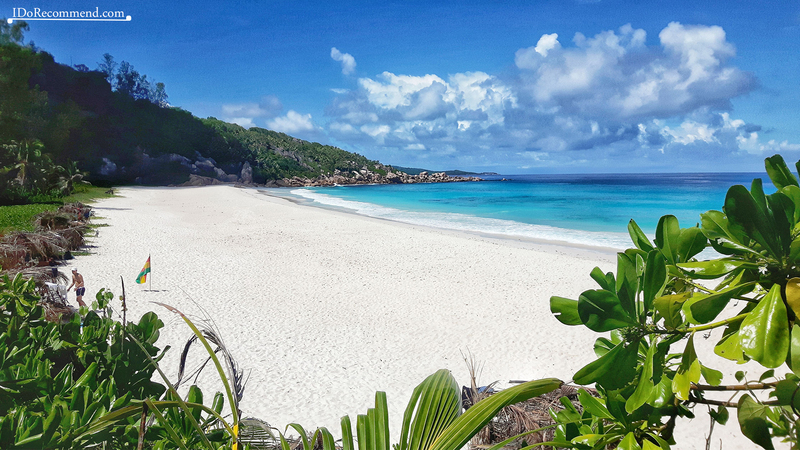 The next beach is Anse Banane. 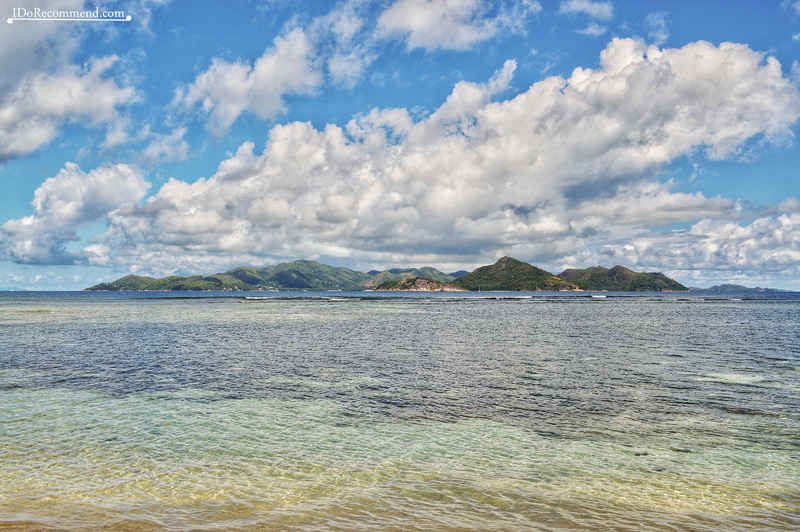 It is usually empty because of the coarse sand and the corals found on the shore. There may be some people at the small restaurant with Creole cuisine right next to it, Chez Julie. 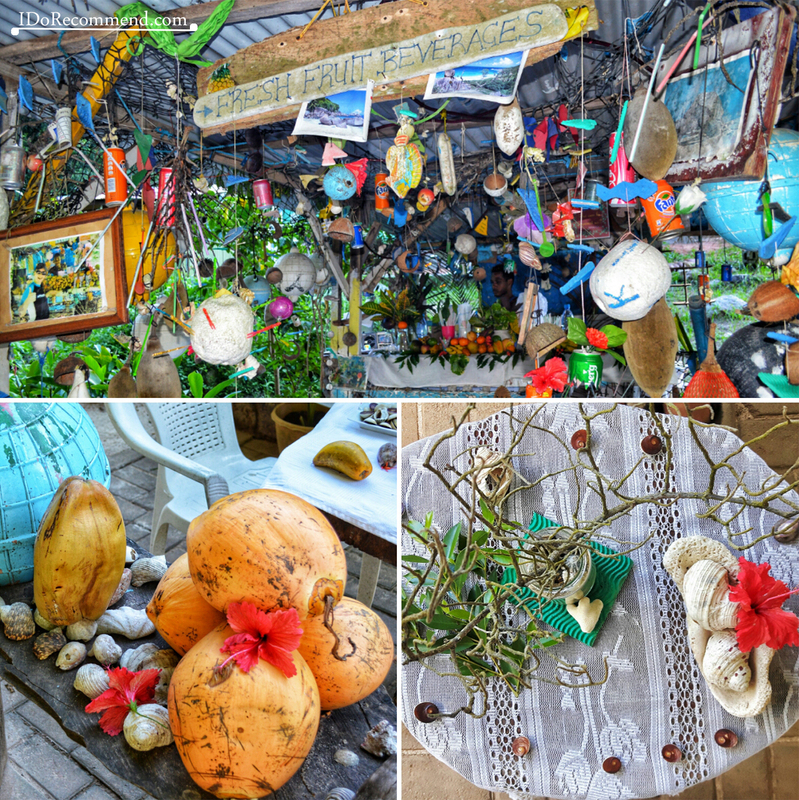 That place has a nice, laid-back atmosphere and its roof is made out of palm tree leaves. They offer an excellent grilled fish fillet and a tasty octopus salad. 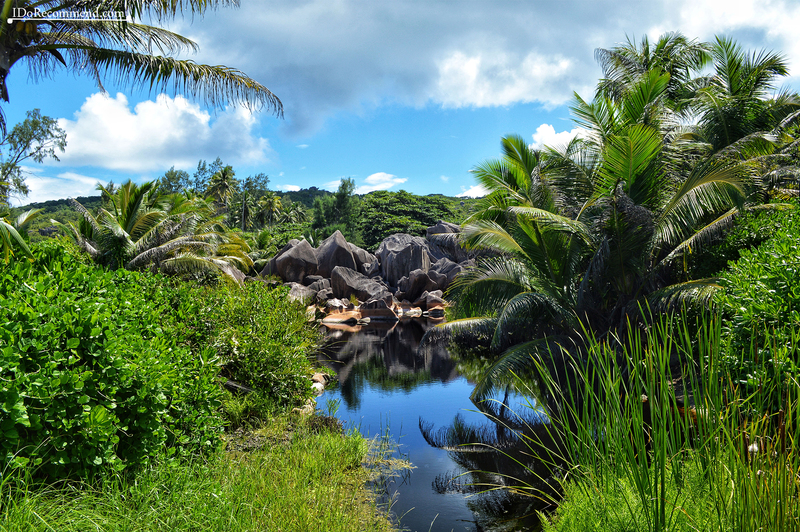 Following the small coastal street you will arrive to its end in the east of the island at Anse Fourmis beach. 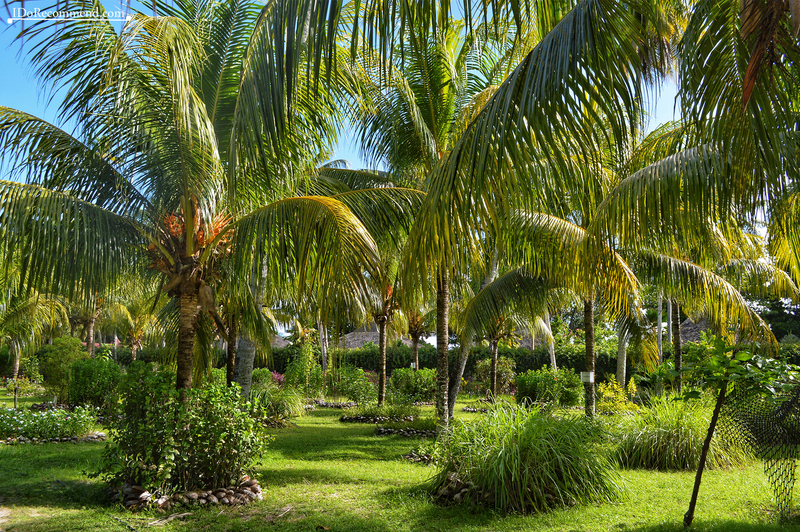 The representative element of this island is the coconut palm nearly parallel to the ground. In the past there was a swing hanging from it. 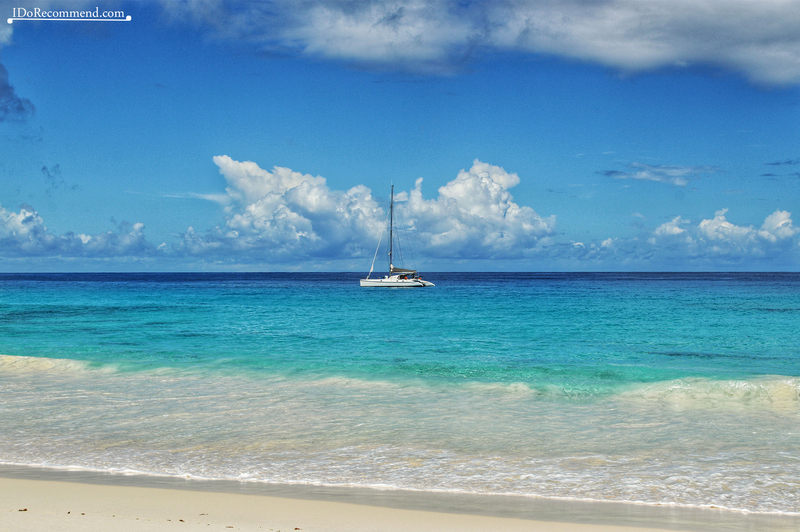 The beach is perfect for relaxing and popular with sunbathers. The itinerary on that day was about 13 km long and it took us ~2h (without counting the stops we had). 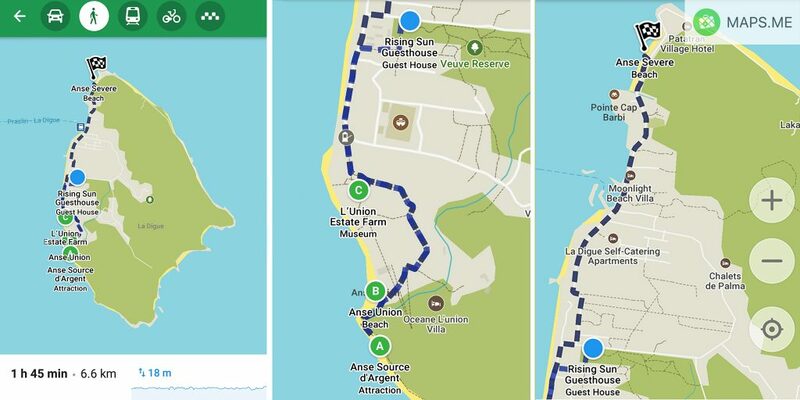 It is not possible to go all the way around the island by bike. 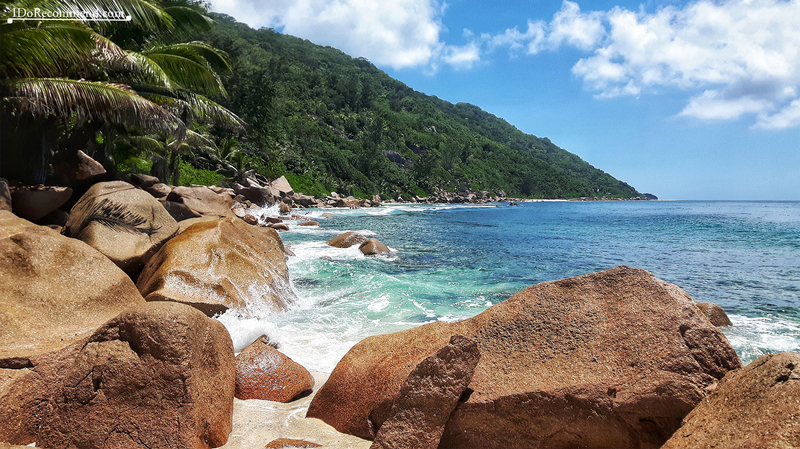 The road ends at Anse Fourmis beach. 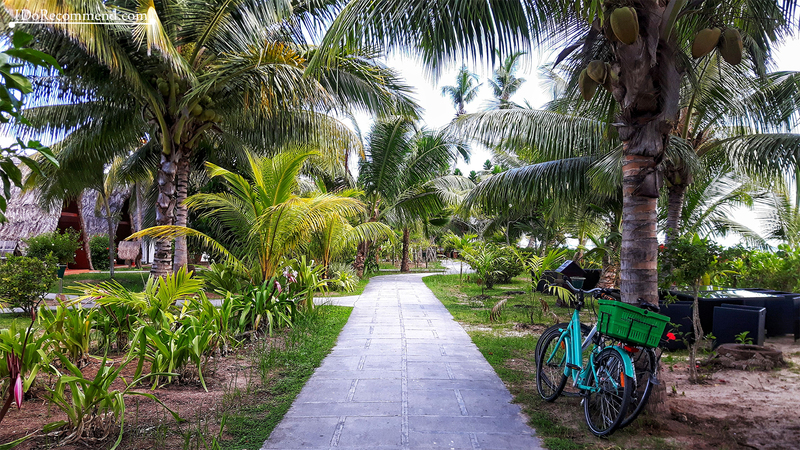 There you can park and lock the bike and continue the way on-foot in the lush forest until Anse Caïman beach. 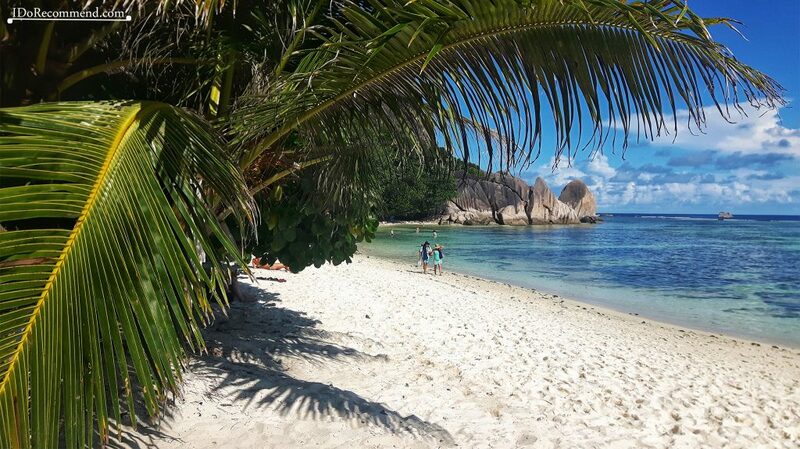 For us, that was the most difficult and at the same time one of the most amazing experiences on La Digue. Make sure you have some fruits/snacks to eat and enough water with you. The path that goes to Anse Caïman it’s not marked and it goes all the way parallel to the shore. It’s not an easy trail. In fact it is dangerous because it requires walking across slippery rocks. If you are not an experienced hiker or if you are alone, we would definitely recommend you to come with an experienced tour guide and to wear sports shoes. 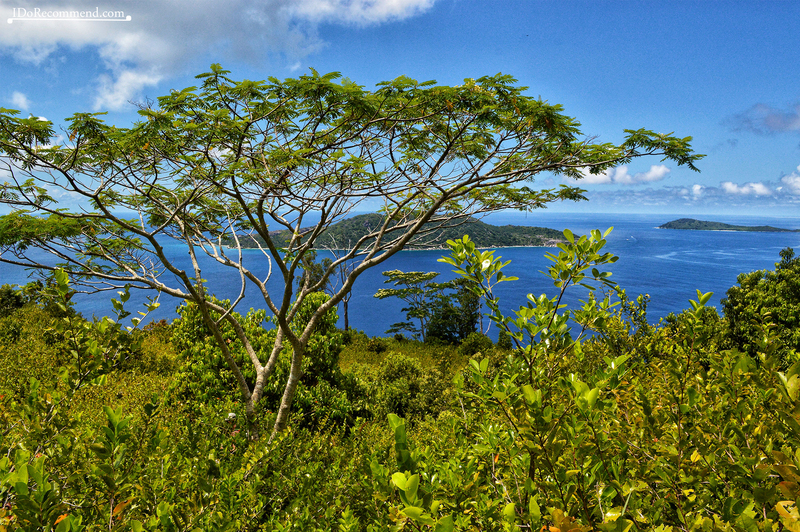 All in all, the trail offers some incredible scenery seen from above as you approach Anse Caïman. 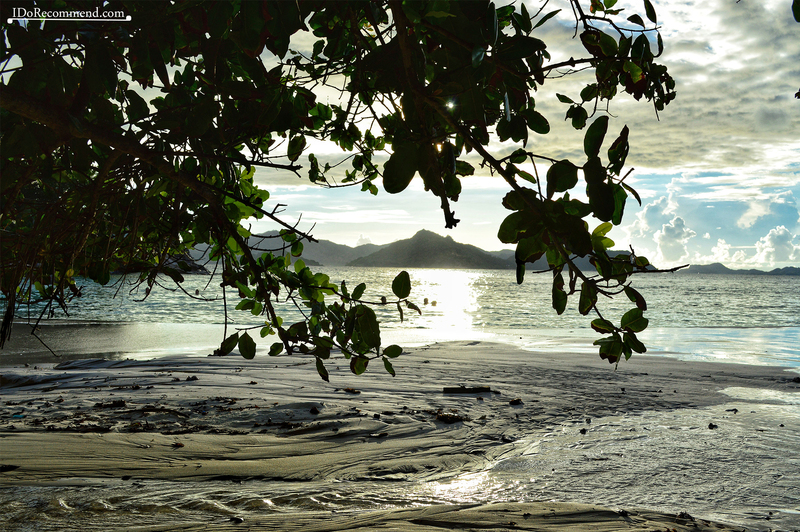 When getting to the beach you will feel isolated, surrounded only by the amazing and silent nature. The sea is rough and the water is deep in that area. 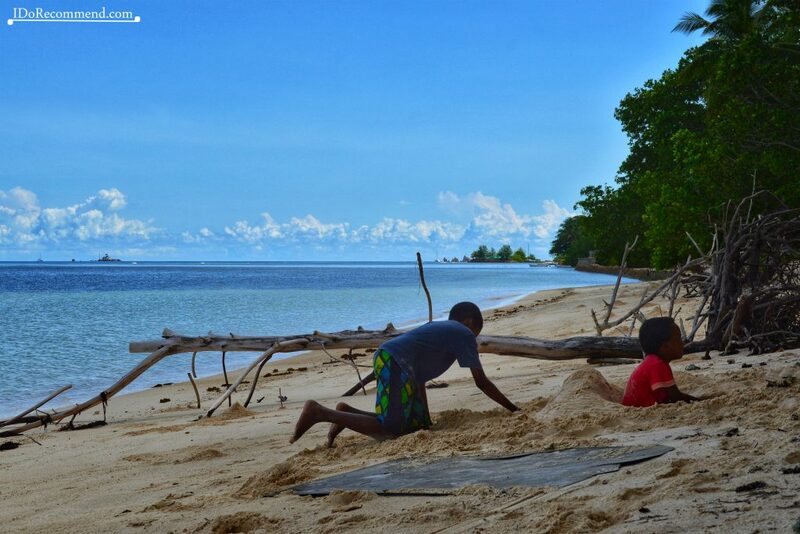 Instead you can have a picnic while hearing the sound of the ocean and being caressed by the sunrays. The most disappointing thing during that challenging hike was that we found a lot of plastic bottles brought by the ocean and hidden beneath the rocks. We tried to collect as many as possible in our backpack and we took them to the closest garbage can. We are totally responsible for the environment that we live in and our bad habits and actions may have such a big negative impact on our Planet! Let’s be more aware of it! The itinerary on that day was cca. 9 km long and the round trip took us about 3h. 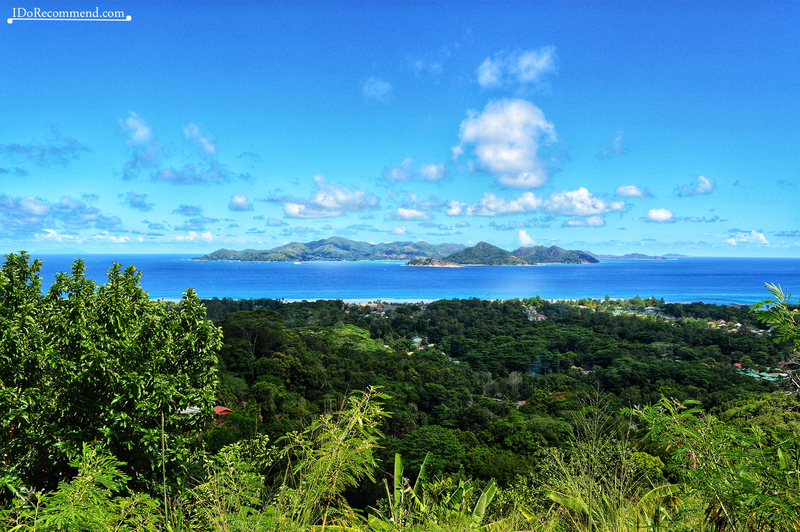 Nid d’Aigle is the highest peak of La Digue. I recommend you to start walking to Nid d’Aigle early in the morning as it is more comfortable in terms of temperature. It is possible to ride a bike almost the entire way, but on the last part of the trail you have to go on-foot. 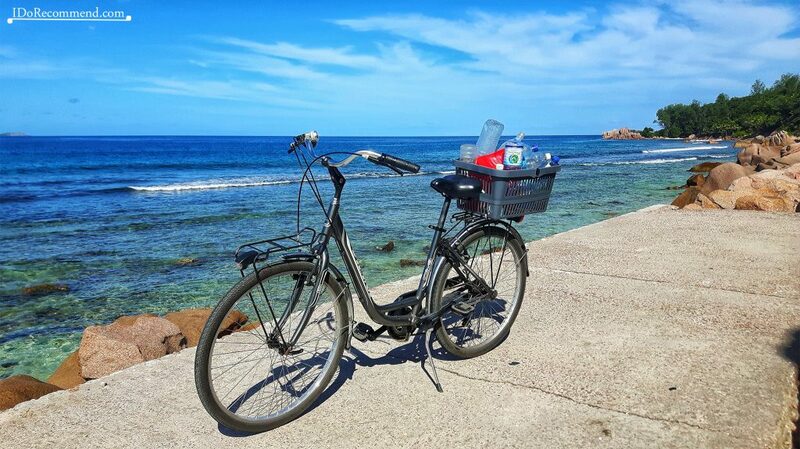 The bicycles on the island are not in the best shape and the road is steep. Up the hill at about 20 minutes before Nid d’Aigle there is Belle Vue. The trail until this point is not very harsh, but neither the easiest for people who aren’t in good shape. The real hike starts from Belle Vue. ADVICE – Pay attention to not get lost! There are no markers on the way and the shade is minimal. Therefore, the climb should not be underestimated. 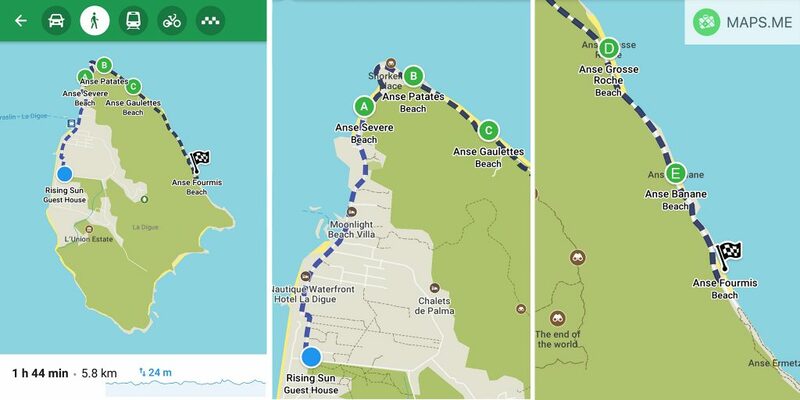 For us MapsMe offered more precise directions compared to Google Maps. You have to take the narrow path that starts behind the restaurant. After about 10 minutes, you will reach an intersection on a ridge. After that turn right and follow the path for 10 minutes until you reach Nid d’Aigle. 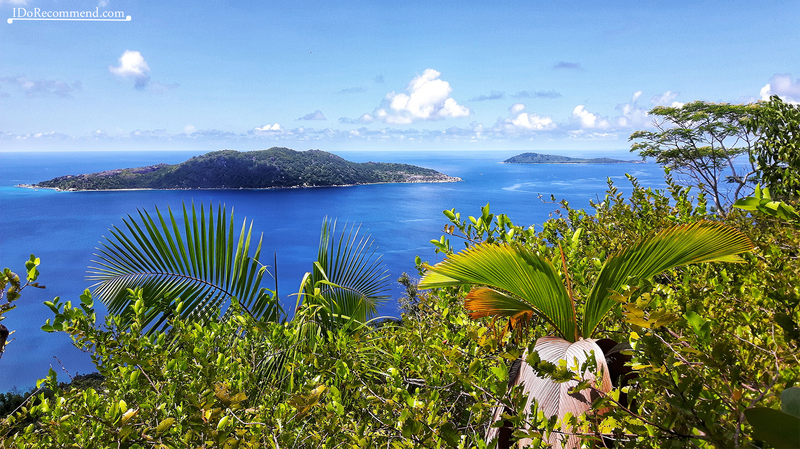 There is no marker on the top, but from the highest point you will see Praslin, Felicité and Marianne islands in the distance. When descending, you can take another path in the north direction. This leads back down to the main path in the village. 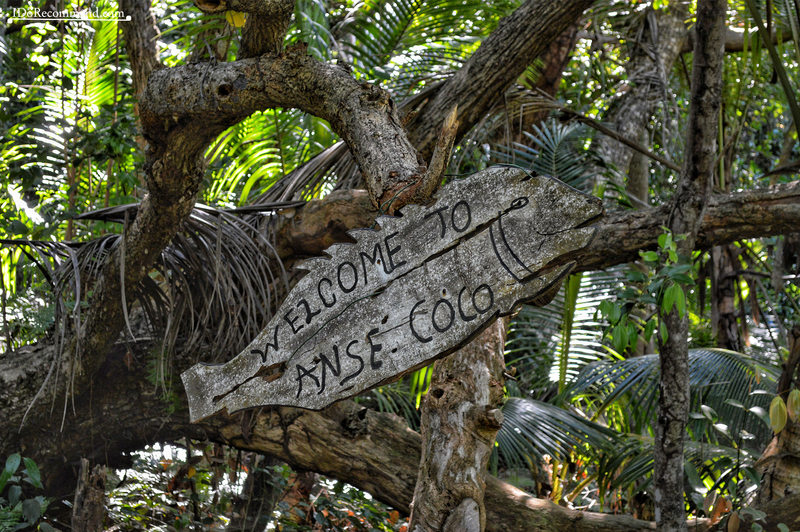 It is also possible to descend to Anse Cocos (about 90 minutes), but a guide is recommended as the path is overgrown. 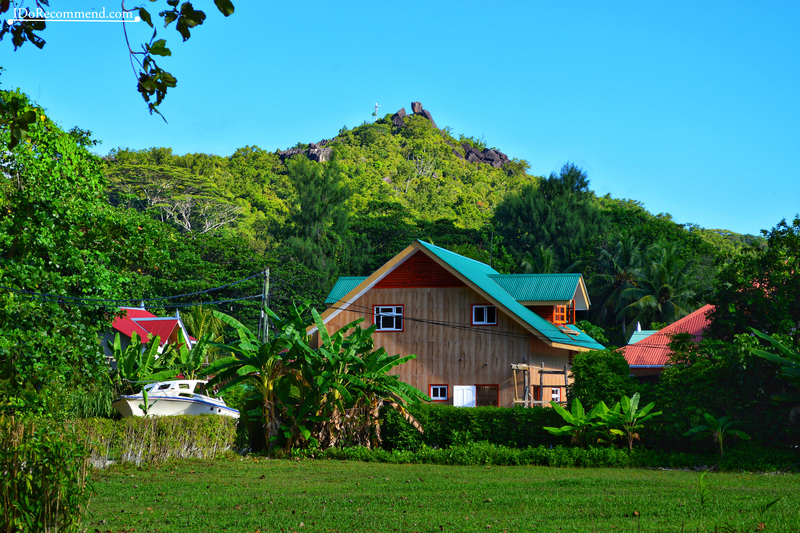 The atmosphere in La Digue village is very quiet and houses are separated one from another by a lot of vegetation. 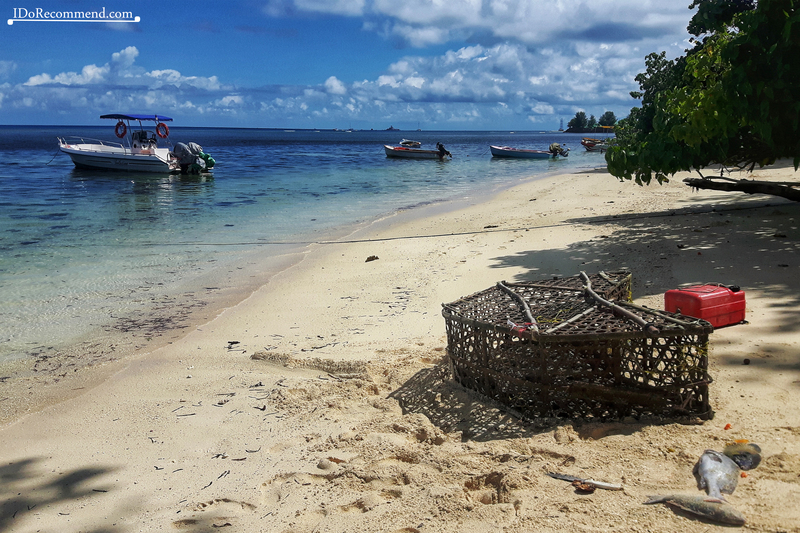 This is how a normal day looks like for the locals: a woman cooking on the beach, some children playing in the sand and fishers preparing a boat (fishing is one of their main activities). 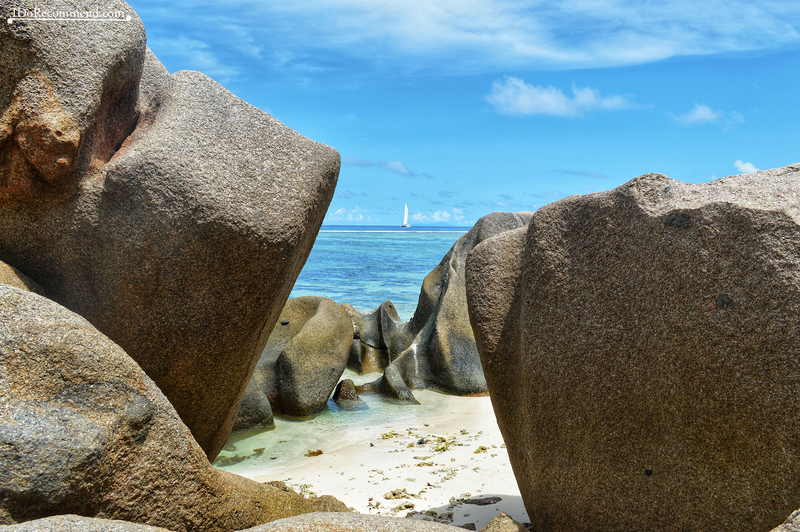 As a brief conclusion, La Digue is by far the island which we liked the most in the Seychelles. It has the most peaceful and relaxing atmosphere. Other useful articles: Things to know before visiting the Seychelles and Top 10 things to do in Praslin.